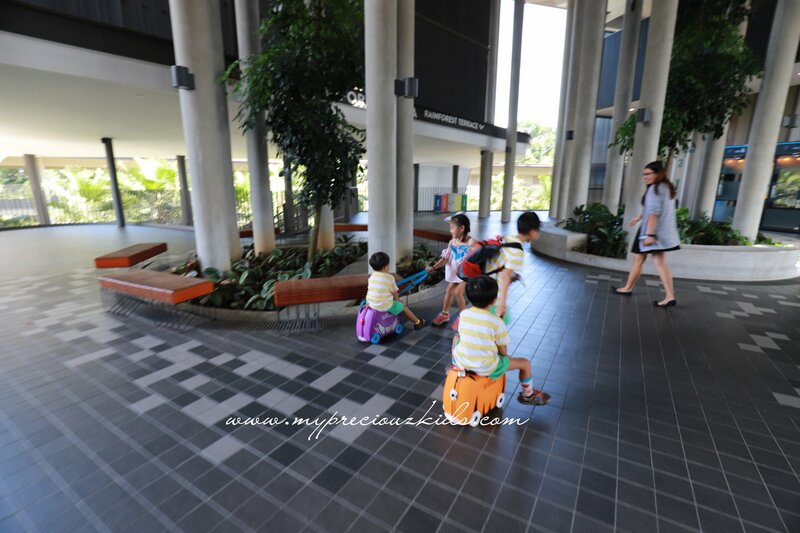 My Preciouz Kids | Sharing the fun, the fashionable, the functional for kids in Singapore through the eyes of my precious kids! Give me a show of hands, who among you ladies don’t like receiving flowers? 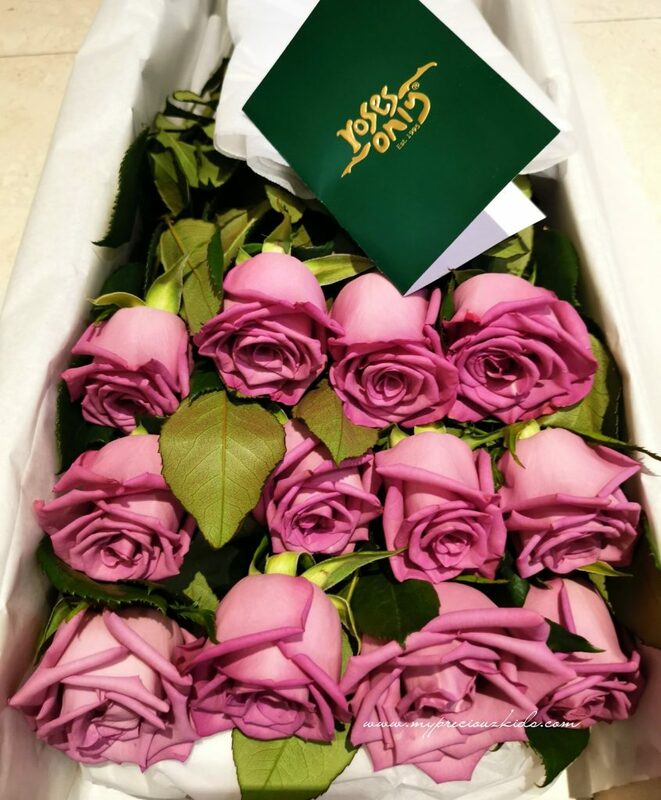 Even though, flowers wither and die eventually (some people or men will lament it is a waste of money) but which lady can resist the natural scents and beauty of real flowers and to be exact the mother of all flowers – roses. 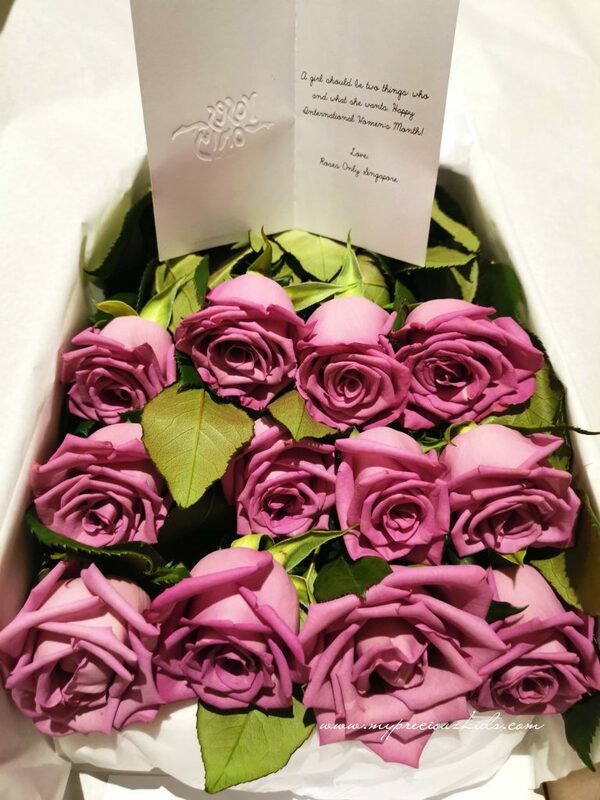 I am no exception as it is extremely lovely to receive flowers once in a while, roses in particular. 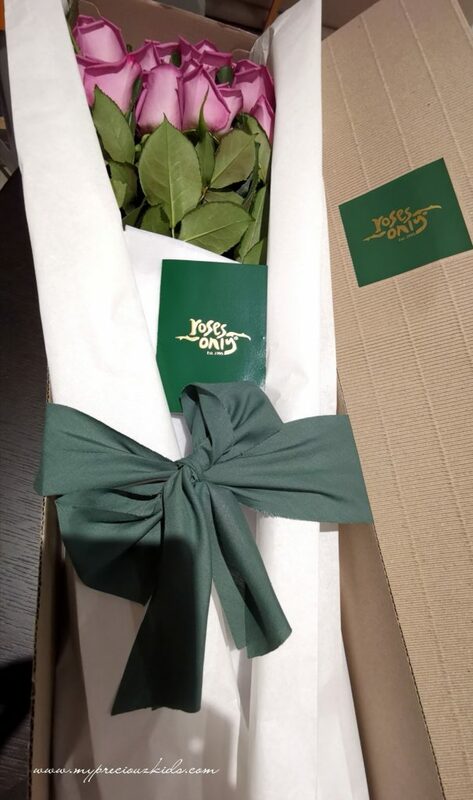 Typically , the flowers came in all sort of arrangement – baby breath, leaves, teddy bears, but how often do you see just un-arranged flowers in a box but yet its just as pretty in presentation. 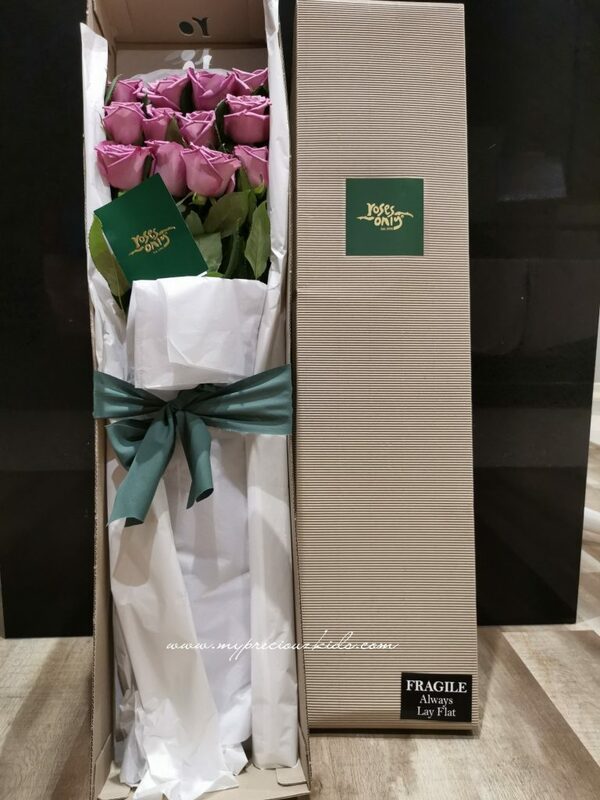 Roses Only Singapore does just that , world’s finest long-stemmed roses in a looongggg box deliverded to all the lovely ladies out there. 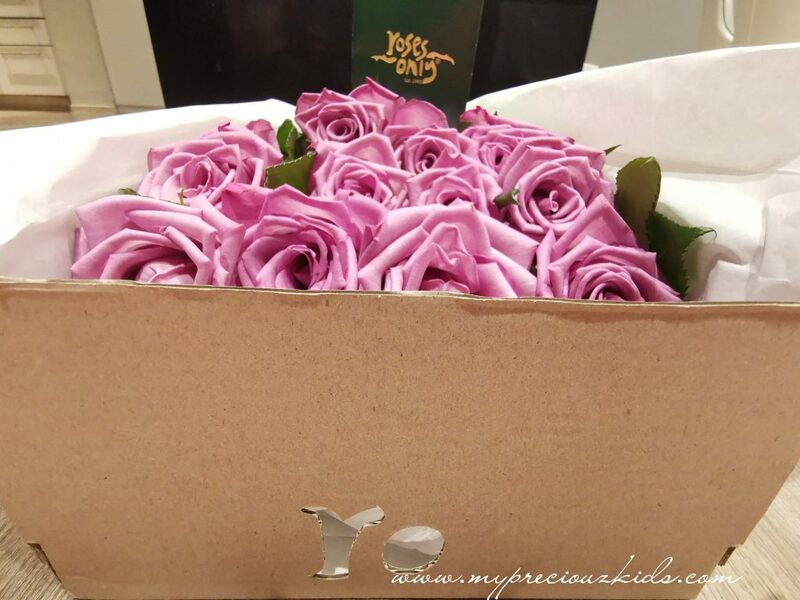 I couldn’t be happier to receive 1 dozen of the most beautiful hue of roses – mauve all with its stems in a box to celebrate International Women’s Day. I measured using my youngest boy, the beauties measured more than 1m long! 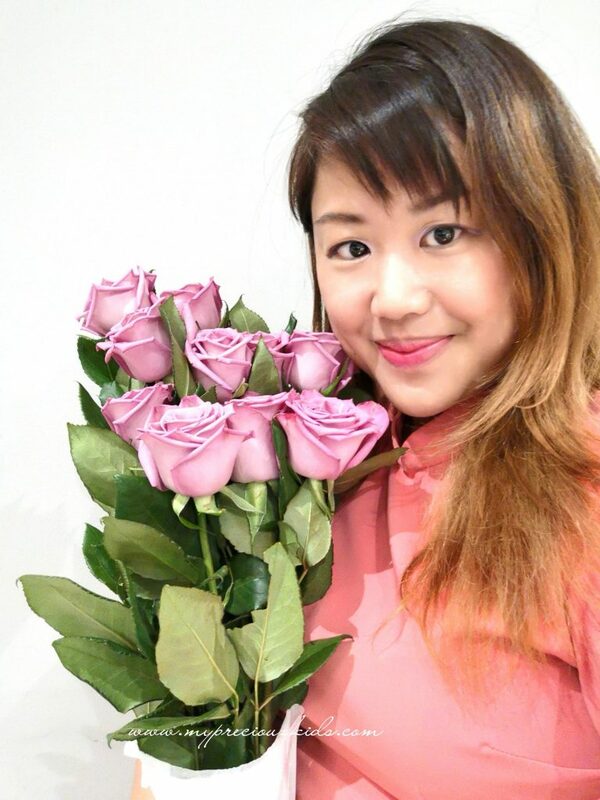 Thank you so much for the lovely roses to celebrate such an important day, Roses Only Singapore. Quote ROSESLOVE for 10% off all purchases for all occasions. 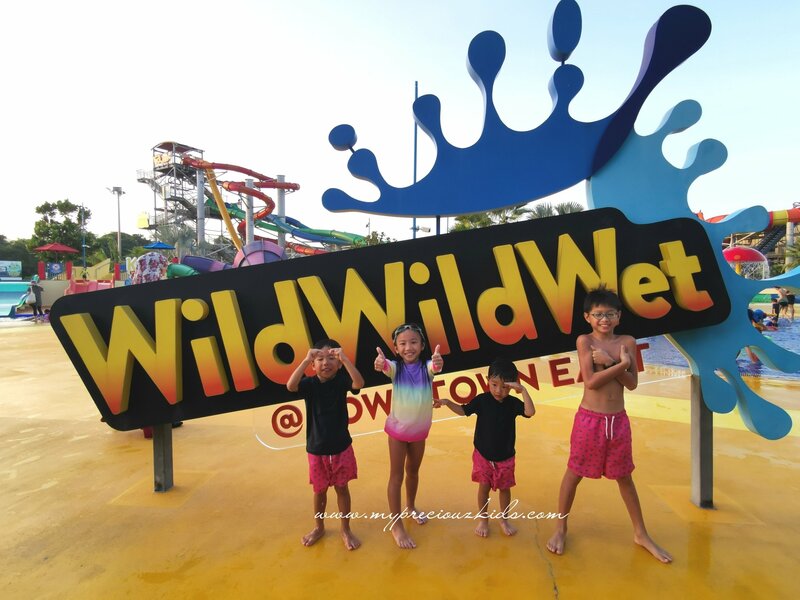 The Wild Wild Wet was indeed the highlight of our staycation. 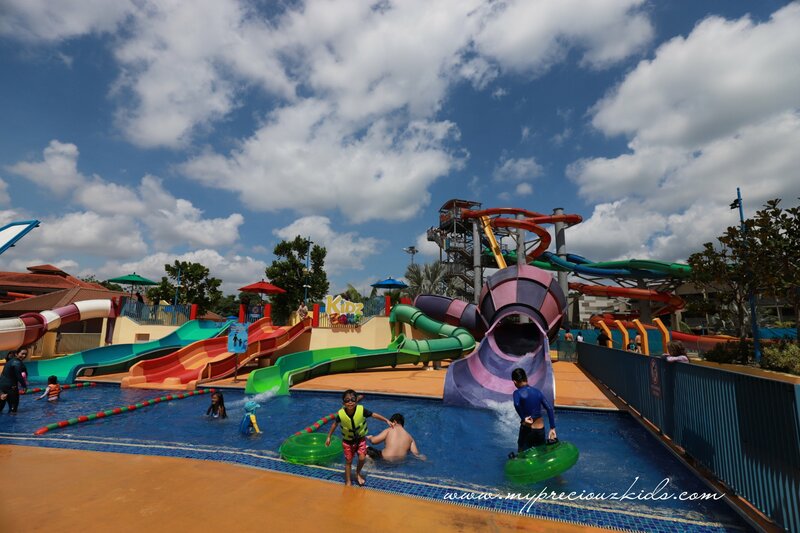 Due to the age and height of my kids, I seldom put waterpark high on my to do list even though my kids love waterplay. 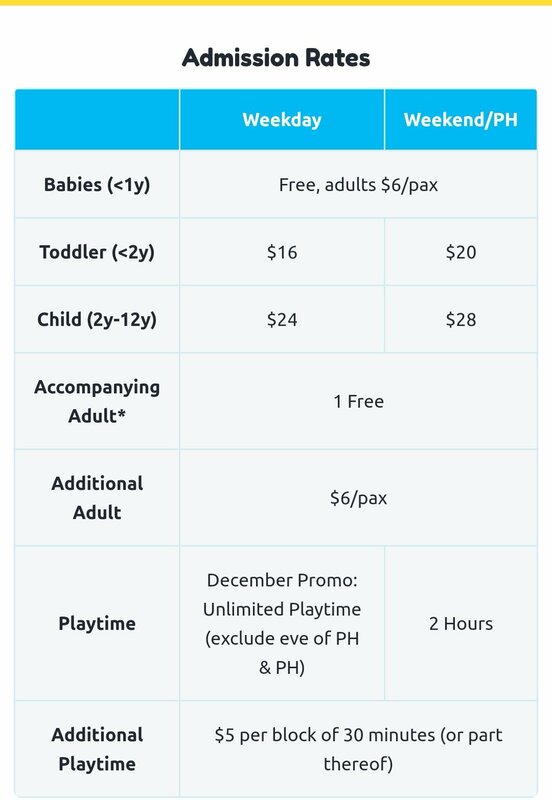 Given there are height requirements and thrill rides that my kids wont be able to ride, I don’t really consider water park as a choice destination for me. 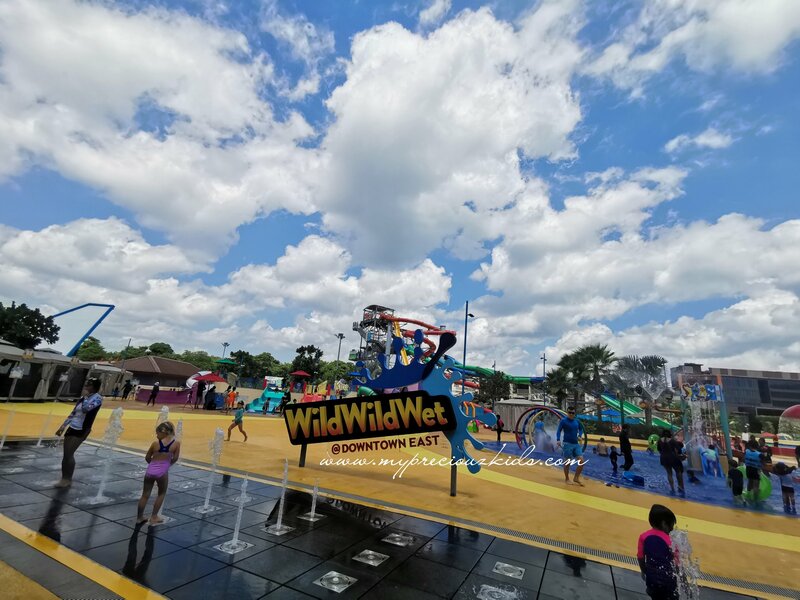 I am so wrong as Wild Wild Wet has lots to offer for young kids, there are many play areas that do not need any height requirements and perfect for family bonding. Even at the entrance, I need a quick check on their height only big J can try most of the thrill rides. Big C was a little shy off the 1.22m (which is ideal height to do most of it all especially for thrill seakers) ! In the end, we were there from 11am to 7pm, the kids didn’t want to leave at all (in fact we didn’t do much of the thrill rides and yet lasted so many hours!). 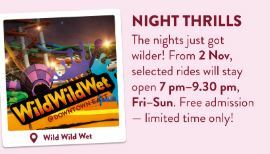 In fact from Fri to Sun, some selected areas of Wild Wild Wet are opened to public (FREE!!) so we could have stayed on if we wanted to. 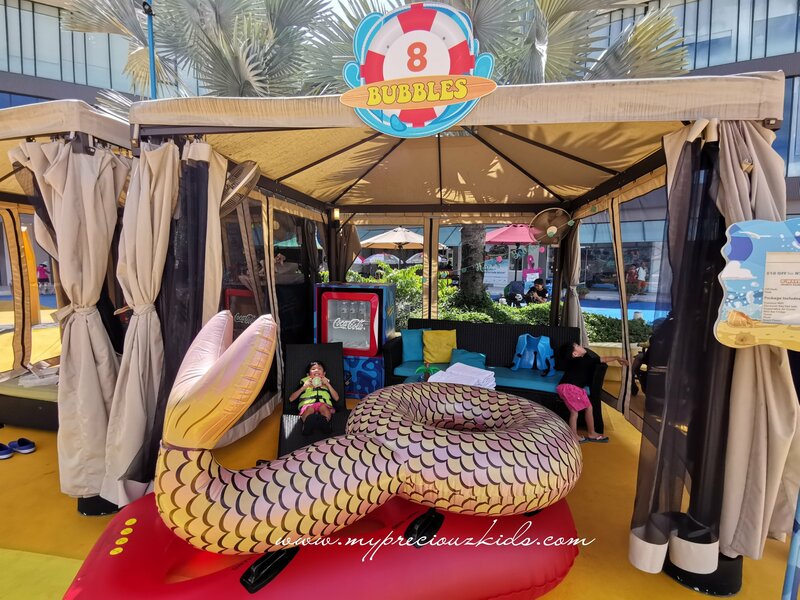 Thanks to the good folks at Downtown East, they even arrange a Bubbles cabana for our full day usage which comes with towels, snack platter, fridge, locker, premium WiFi and a big float at our disposal. 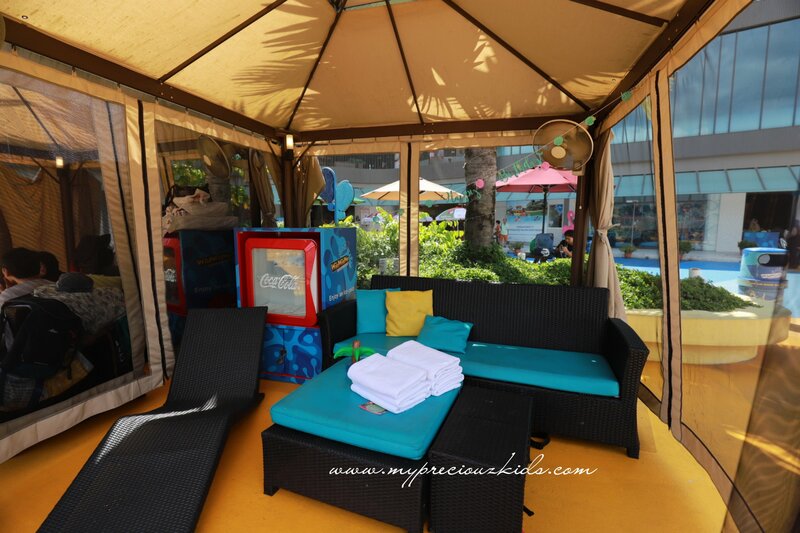 The cabana is a godsend which offer us respite from the hot weather outside. At the late afternoon, the younger boys even manage nap a good hour, it’s not air-conditioned but there are rotating fans and a blackout layer which really did an amazing job protecting us from the sun. 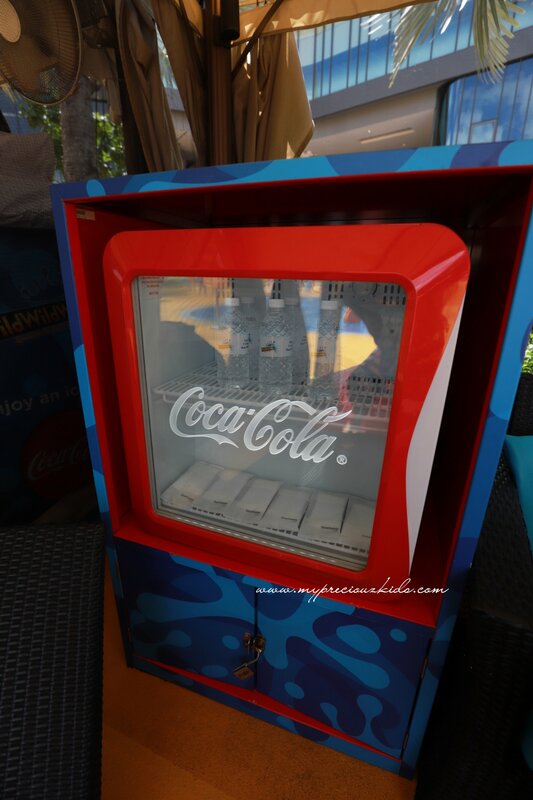 We can also keep our drinks and food chilled and our valuables safe as there is a locker facility provided. 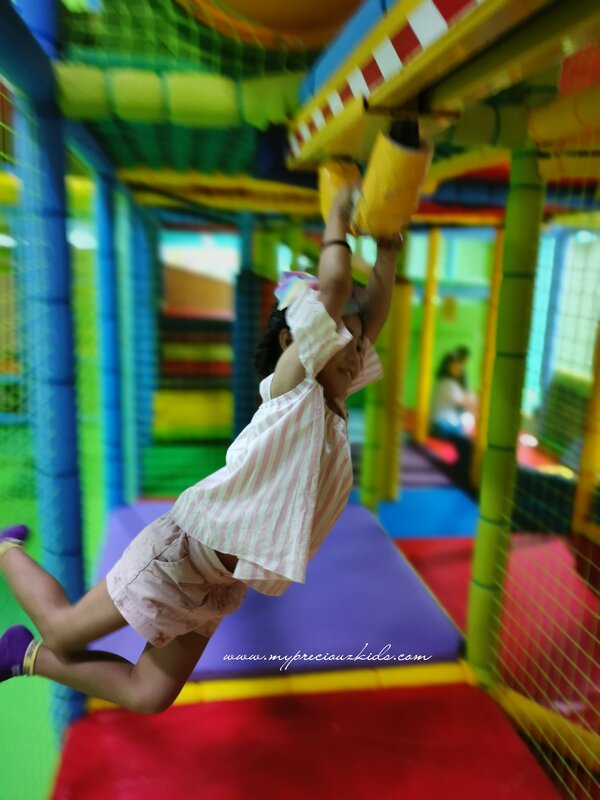 I will focus more on the areas where there are no height restriction suitable for families with small kids like mine. 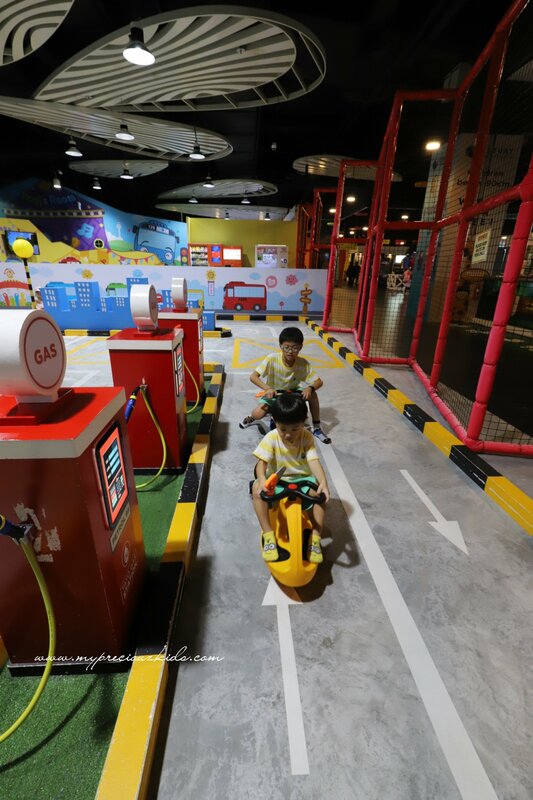 Even the fountain display in front of the entrance is a worthy place to play as the kids played this last until closing time! 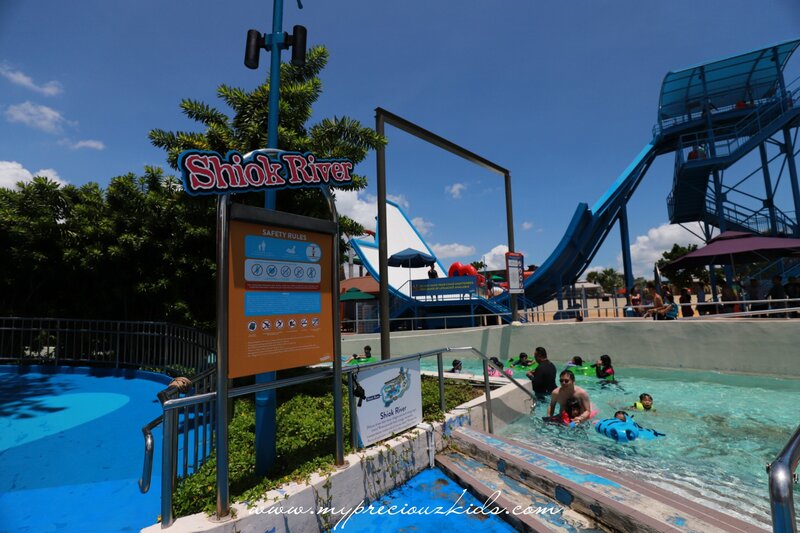 I am sure you can spend hours covering the above areas alone ignoring the thrill rides which has height requirement. That’s said when the younger ones were napping, I had to try some of the thrills ride. I had a go at Ular-lah and Kraken Racer with big C and a solo on Vortex. 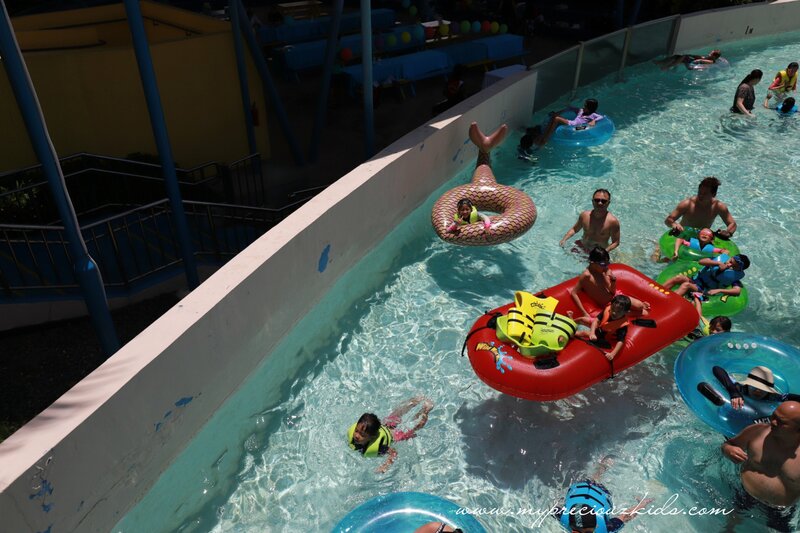 All the water rides were world class standard. A decade ago I had tried a similar water thrill ride like free fall at Atlantis Dubai and we have the same one here. But 10 years on I lack the guts to try it again unfortunately. 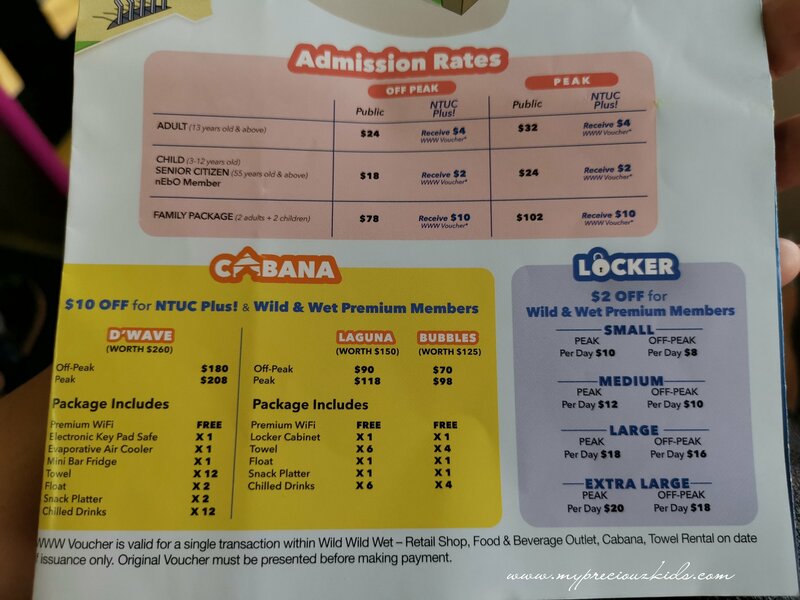 There were easily more than another 5 thrill rides that I didn’t get try – Torpedo, Waterworks, Royal Flush, Free Fall and Slide Up, so I am waiting for big C to grow a little taller so that I can try with her! I am so glad she is a little dare devil just like me! 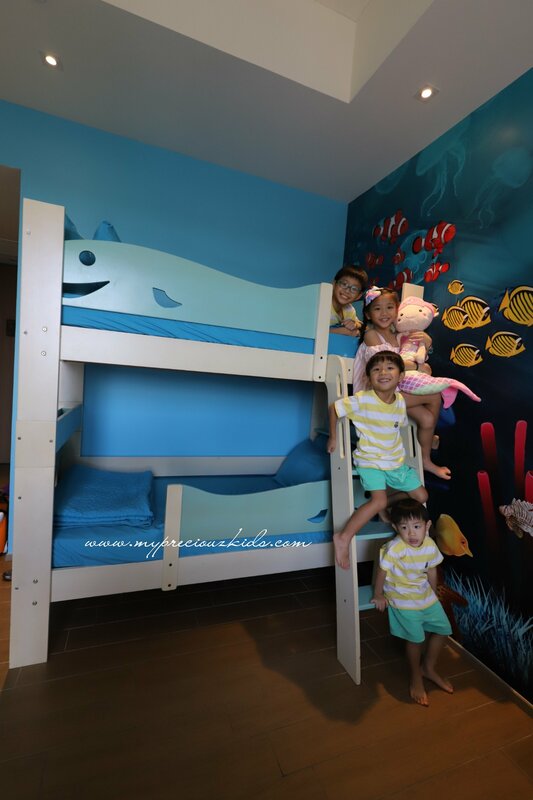 For staycation, Wild Wild Wet will definitely take up a full day with little energy left for the night. 8.There is also a cafe for darts and snooker/pools for teens and adults too! The choices for food is AMAZING! 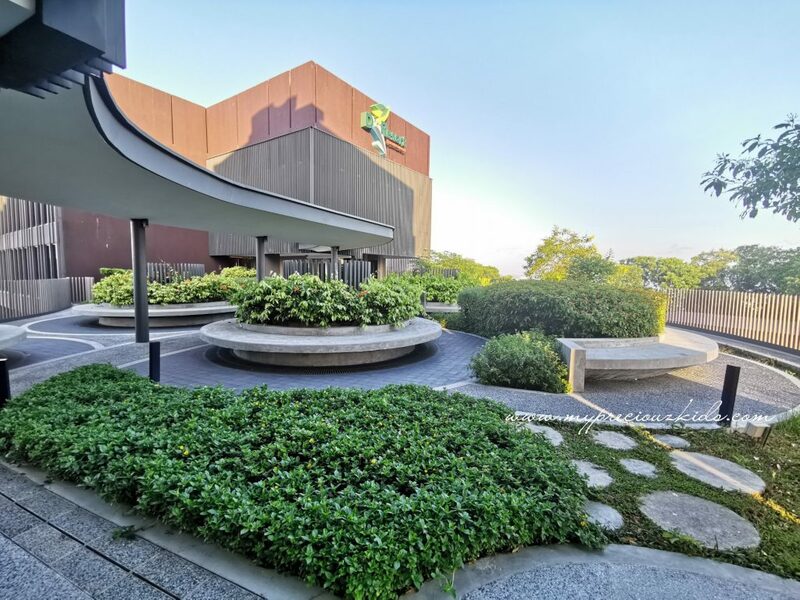 There are more than 40 eateries at both E Avenue and E Hub from fast food, buffet, Chinese restaurants, Japanese, Korean, Western food. 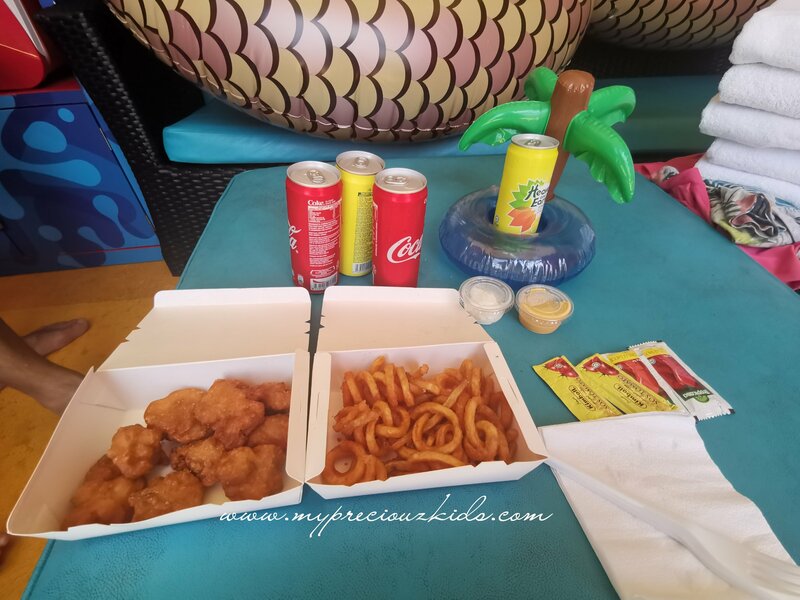 We didn’t even have to drive out to look for food, so I truly appreciate the convenience of having food and play all connected to D’Resort. 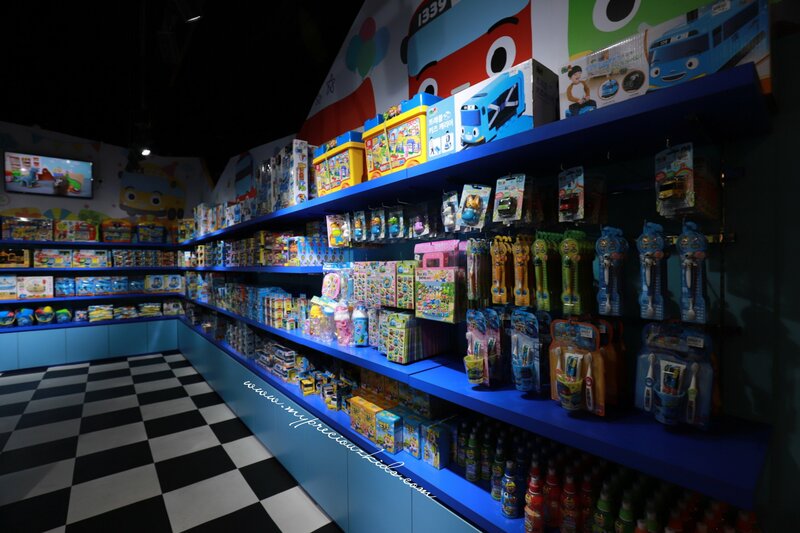 So there is really something for every kid of different age. 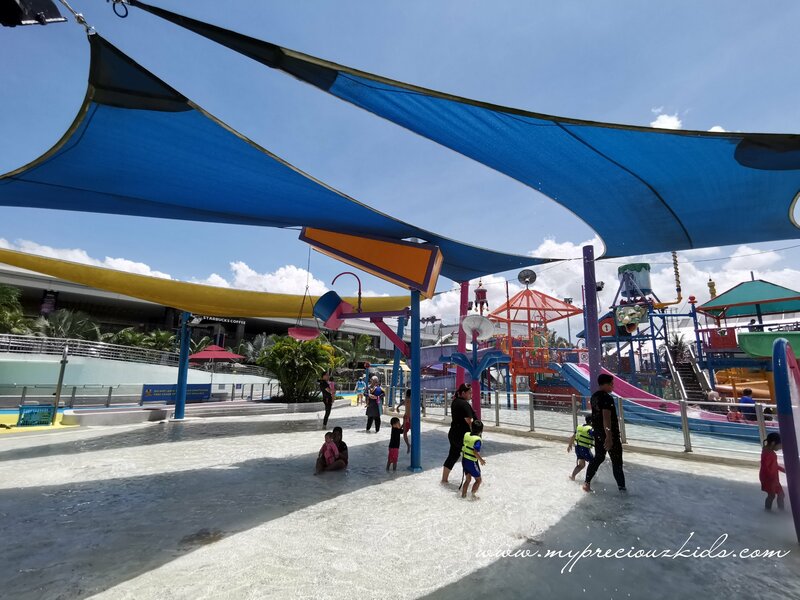 For myself and hubby, it’s a very easy and fuss free staycation half hour away from home for a short break from the daily routines and just spend quality time together as a family and the prices are pretty affordable too especially if you are a NTUC member. 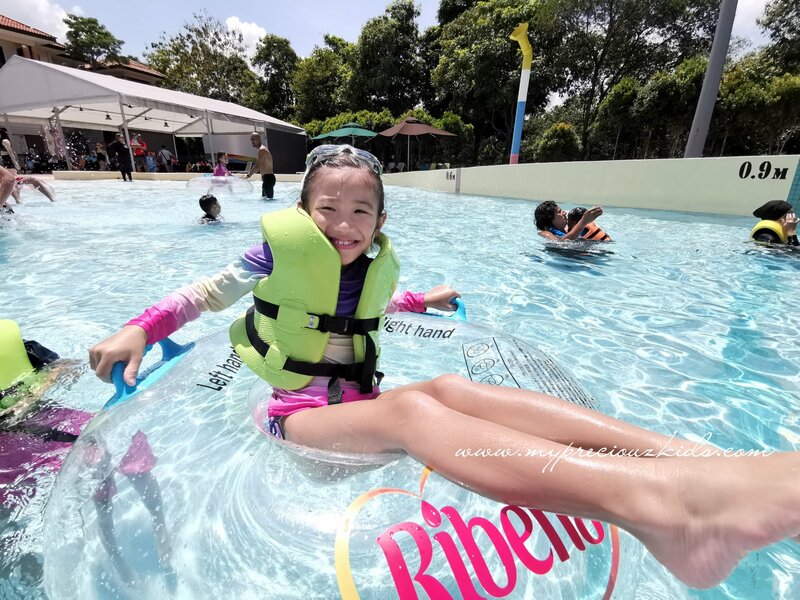 Thanks to the sponsors, I have 1 family package of 1 day pass for 2 adults and 2 kids worth SGD 102 to be given away on Facebook. The day pass is valid everyday till 31 May 2019. 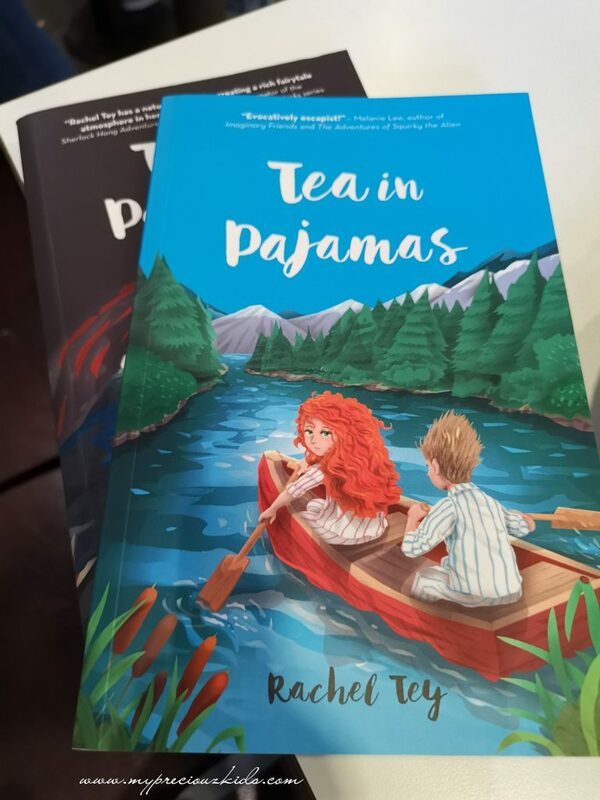 Giveaway ends 13th March 2019 Wednesday 2359. 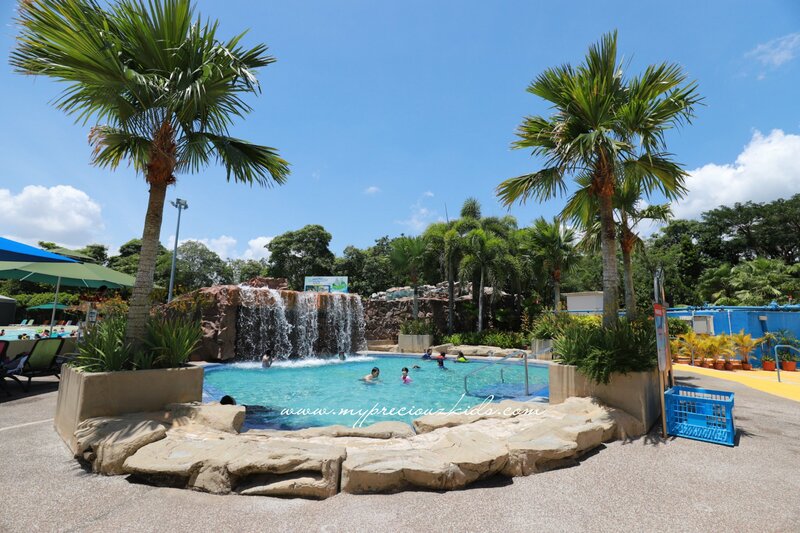 I am glad after my 3d2n weekend staycation at D’Resort I had a few changes in mindset. Wrong! 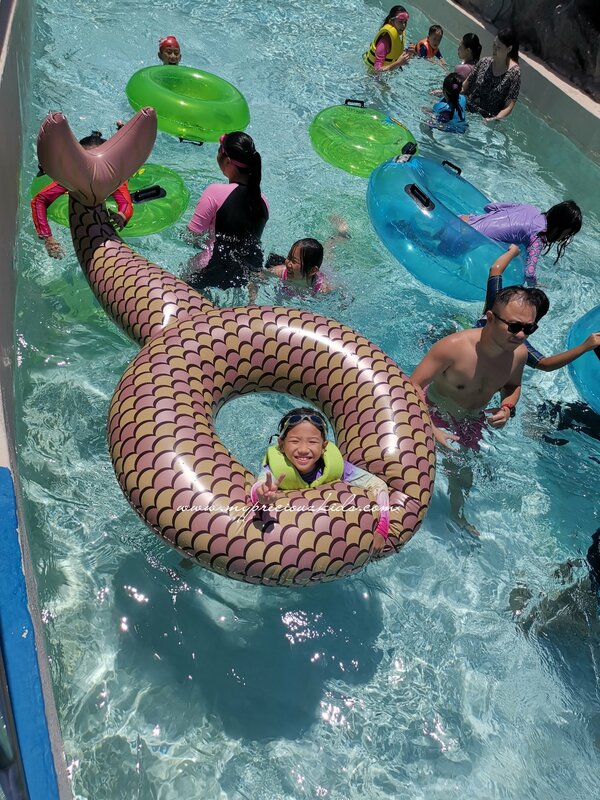 In fact, the number of times we actually went all the way to Downtown East is less than 5 times in the 10 years I have kids – twice for shows and twice for an event (and we even stay in North East not even at the far west). I actually drove myself and 4 kids to check in first as the dad is still at work. It was a 30 min drive from my home to a place where even with 3d2n ie 48 hours plus is not enuf to cover all that it had to offer. 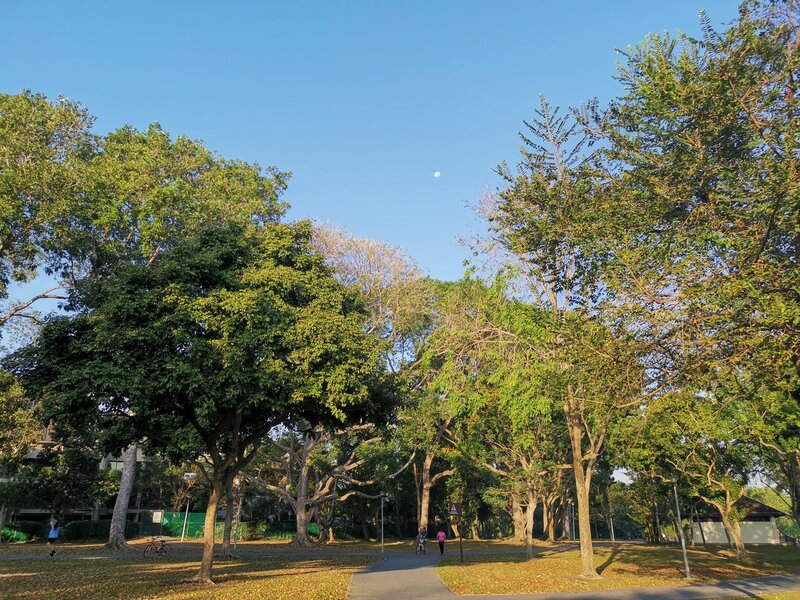 As for tourists visiting Singapore, it’s a mere 10 minutes drive from Changi Airport. Wrong. 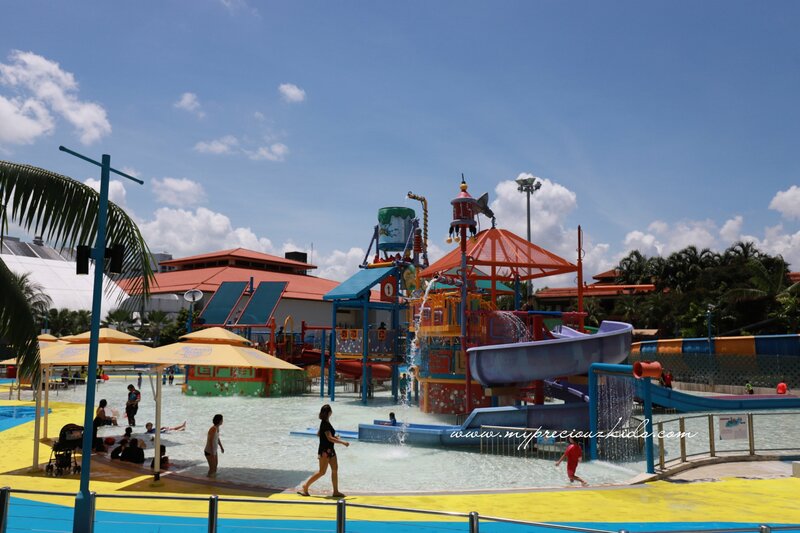 Yes I believe the place started out as chalets for family to gather and BBQ as Costa Sands Resorts but since 2015 they have renovated the place to be known as D’ Resort to give the guest a nature inspired resort feel with an integrated water park experience. 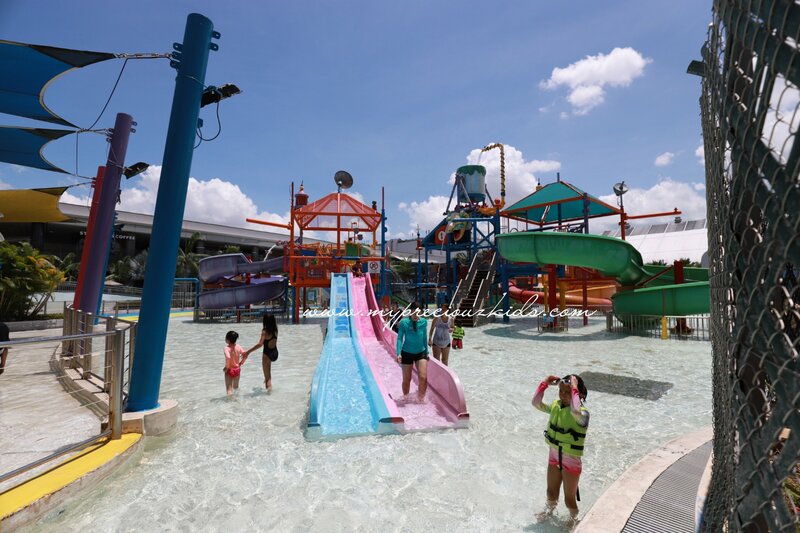 With the revamped Wild Wild Wet (another dedicated post for that) and integration of the resort with the water park, Downtown East has become an integrated resort, even more so with the opening of E Avenue which links E Hub to D’Resort. 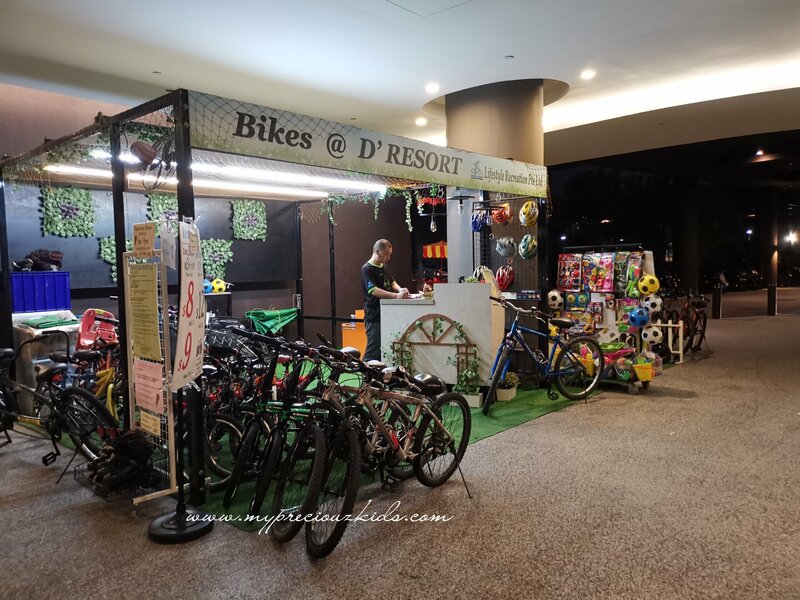 There are bicycles for rental, bowling, karaoke, cinema, massage shops and I lost count the number of eateries and restaurants. 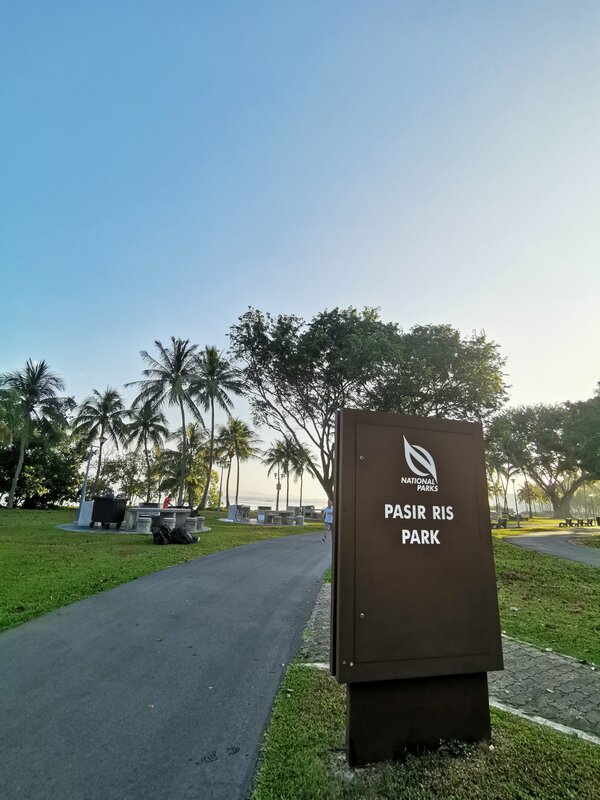 And their biggest advantage is the nature is just right at their door step with a private access to Paris Ris Park. I had coincided the weekend staycation with big C’s birthday celebrations. 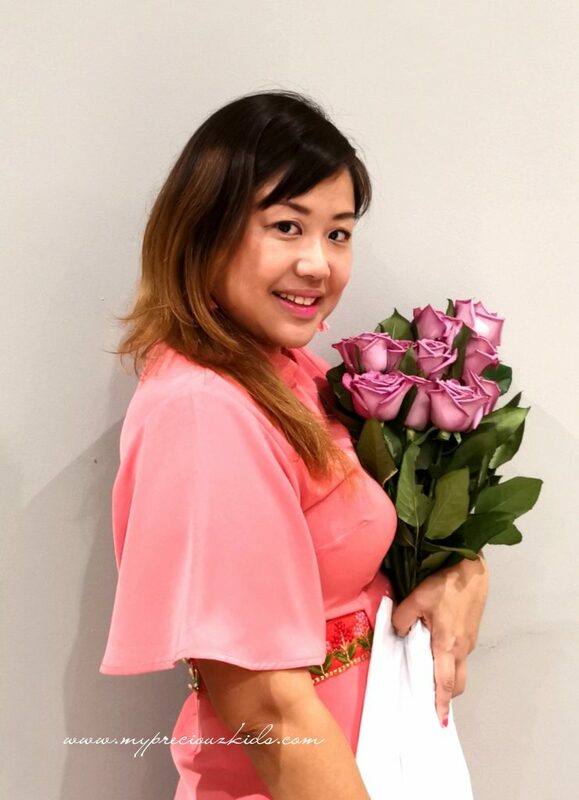 For the past 7 birthdays, I had organised parties for her with friends and families. So this year, I wanted to do something a little different for her 9th birthday. Instead of a 2-hour party, I had it changed to a 48-hour celebration with the family. 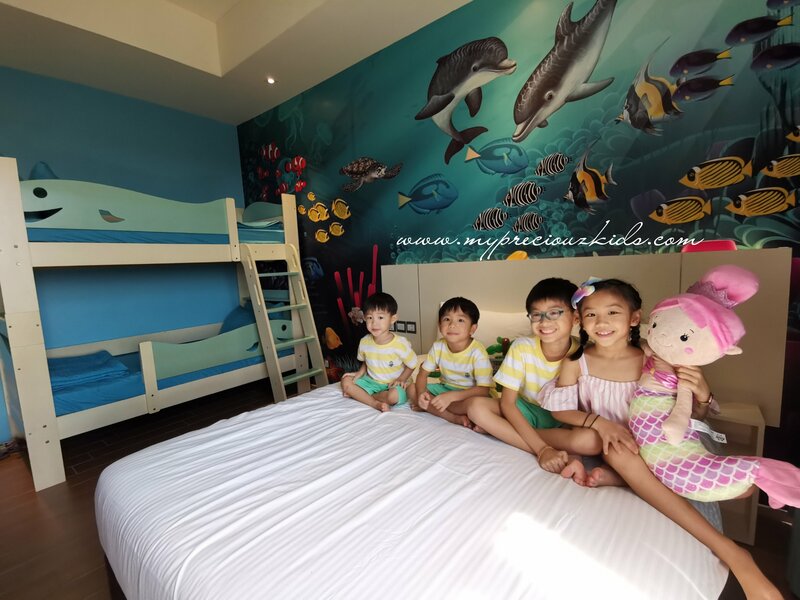 We are going play, eat and sleep just like we are holidays albeit a short one but a fuss-free and one with little planning on my part. So I waited to the older kids to come home from school on Friday and picked up the younger two from child care and off we drove to D’Resort. After half hour drive, I parked at the rainforest block as there is where is the reception is and also the family themed rooms. 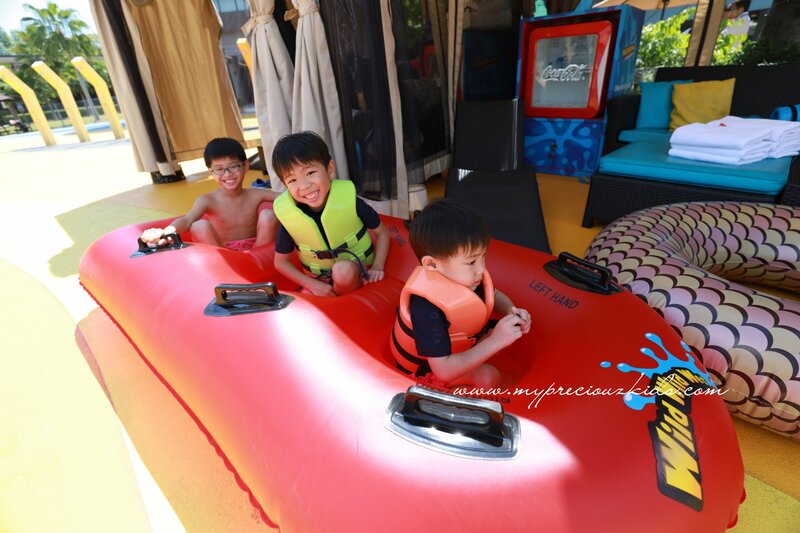 I actually kept it a secret from all the kids especially the birthday day that we are going to have a staycation so they were so over the moon coming back from school to find out that they are going out not just for an afternoon of fun but a 3d2n staycation. 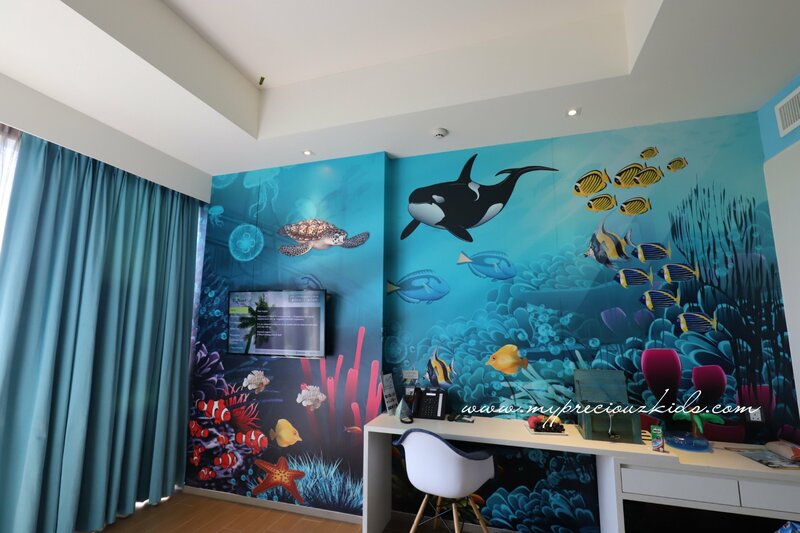 They have 10 themed rooms of which there is a 1 coveted M&M themed room and the rest being either rainforest theme or underwater. 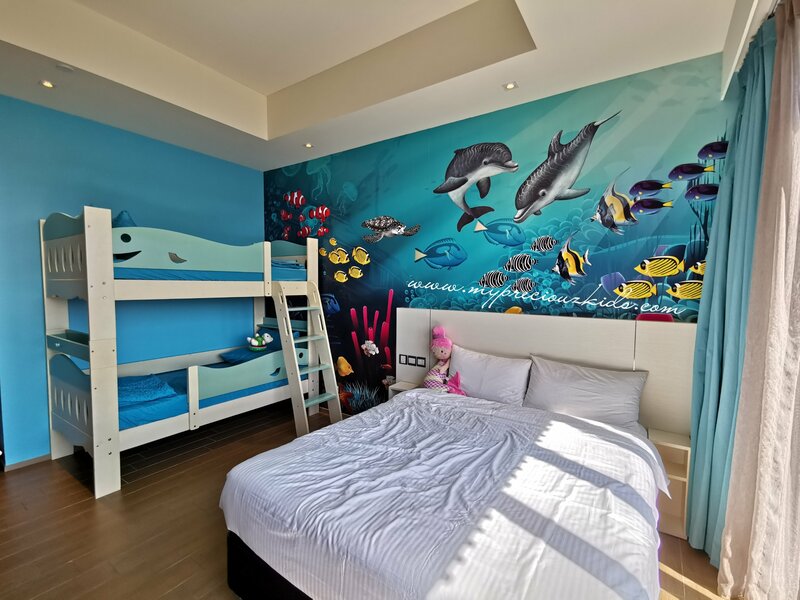 As big C was having a mermaid theme party, I have especially requested for the underwater themed room to match the birthday theme. 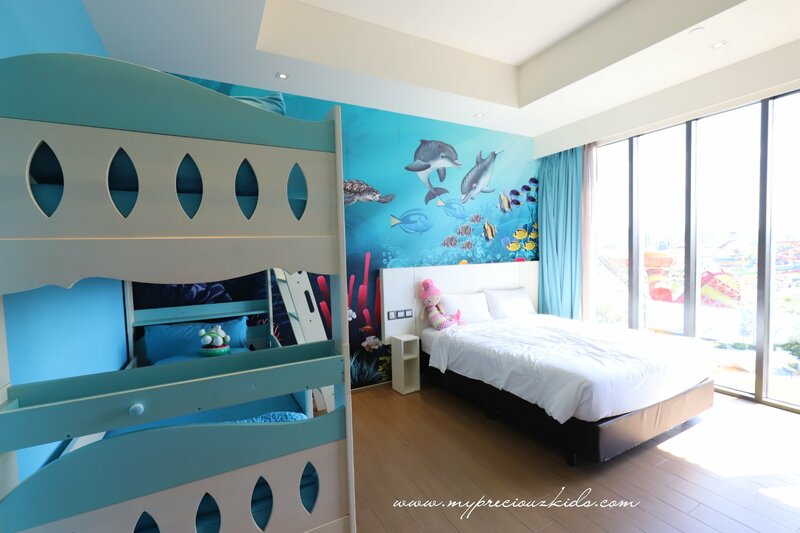 The room is beautifully decorated on both walls with underwater painting and is painted in blue hue. Even the sheets on the bunk bed and curtain are in blue. It was a spacious room, albeit a little squeezy as there was bedding for 4 but I have 4 kids. 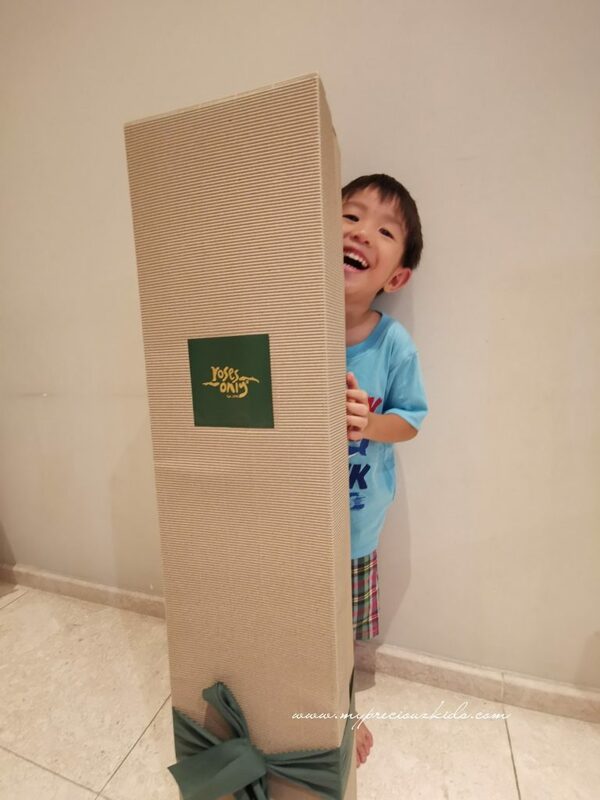 My kids are petite in size so it work well for us. For those with 2 or 3 kids, I would think it would be perfect size as it mean for 2 adults 2 child. 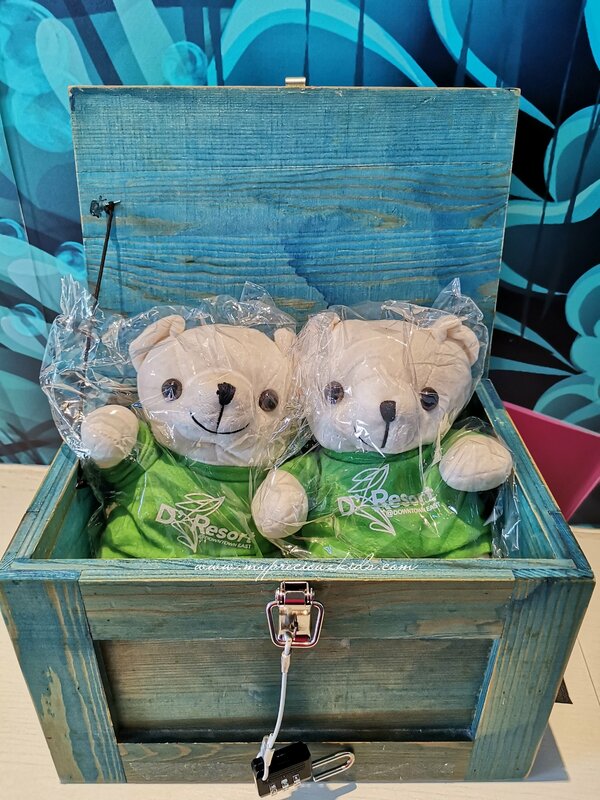 They even have a little treasure box to welcome all kids and little surprises upon opening the box. 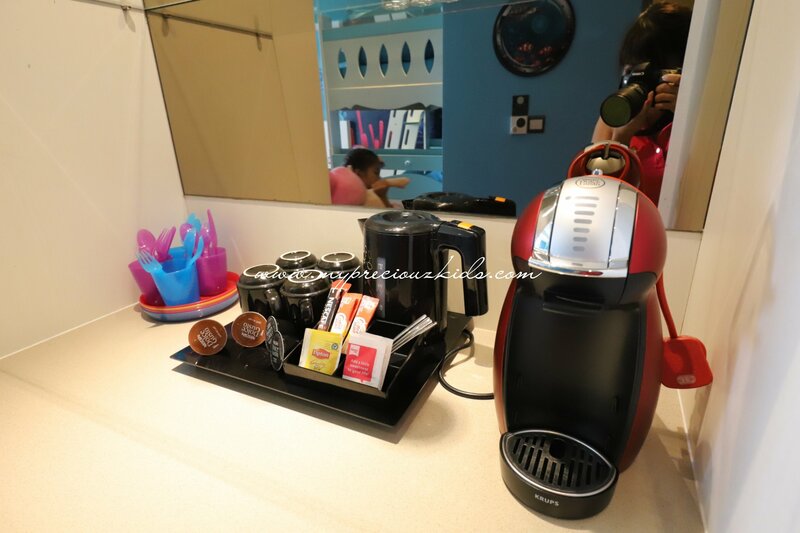 The rooms come with amenity such as a coffee maker and kids friendly items such kids utensils, step stool for the wash basin and a bunk bed. A quick video view of the room on the sunny afternoon that we checked in! 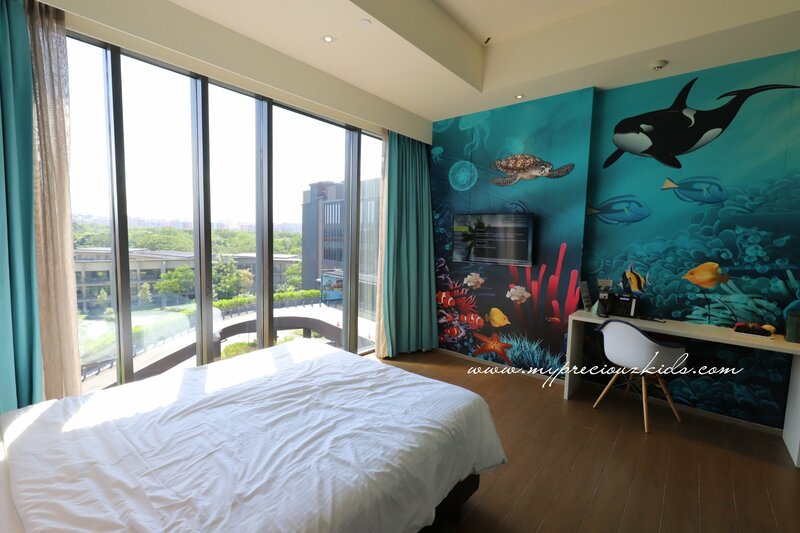 The themed rooms are located on the 4th floor of the rainforest block. They spared no expense to keep the areas as friendly as possible for family with young children. 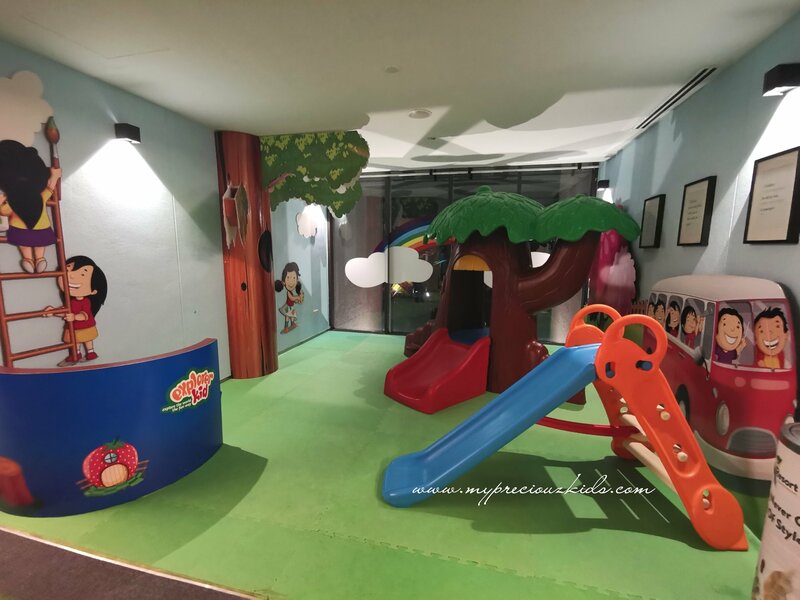 There were even two small play areas just outside our room which the kids had a go before dinner and after breakfast. 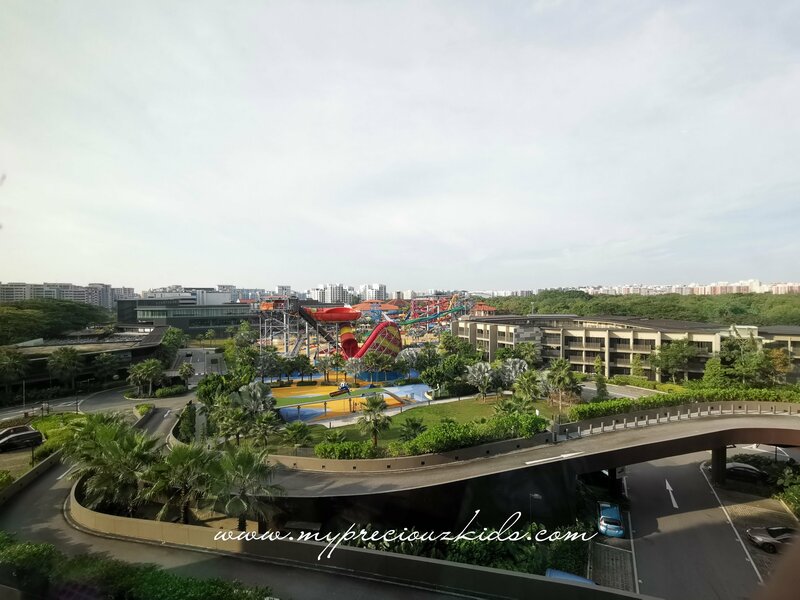 Also on the same level, there is a garden which opens up to the view of Wild Wild Wet on one side and Paris Ris Park on the other side. In the morning, you can watch heron swirling around the park as their nests are on the trees. 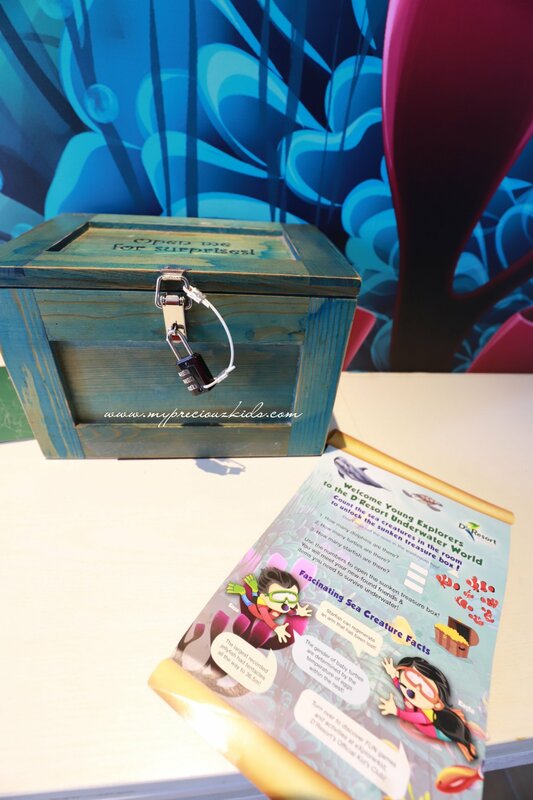 Besides the rainforest themed rooms, D’ Resort offer a total of 387 rooms. You can see the different types of room being offered below. Booking can be made through this link. 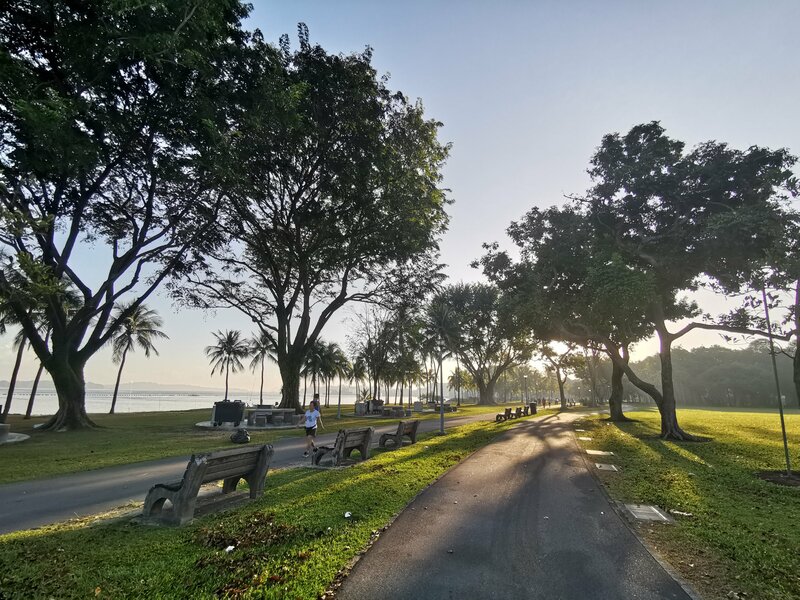 Around the resorts, there is a bicycle rental shop, two karaoke booths and of course the bbq pits booking which are available for Beach Cove, Beach Cove Duplex, Mangrove Walk and Park guests. 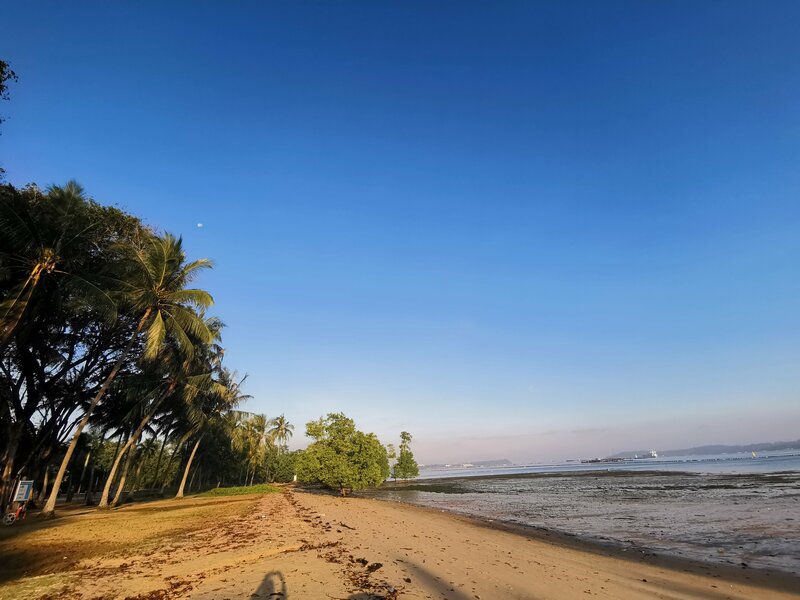 There is also a private access to Paris Ris Park which features a long stretch of beach and a mangrove swamp. 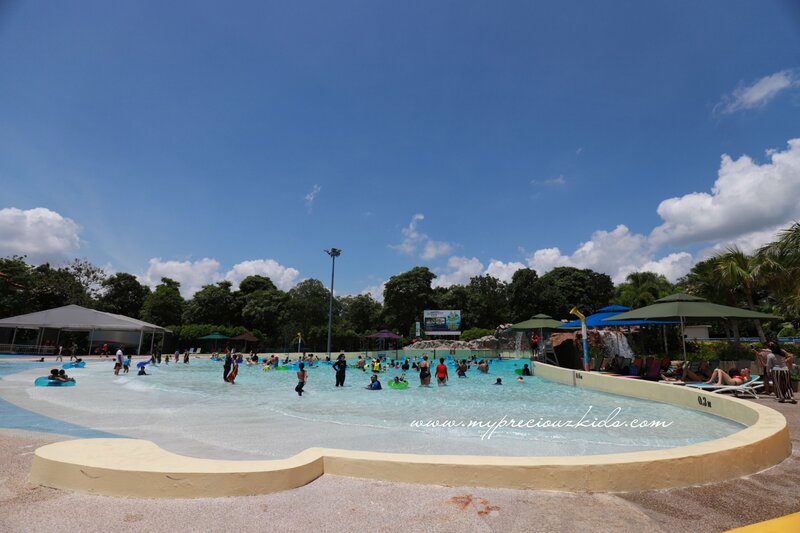 It was a pity that we didn’t have the luxury of time to enjoy what the park has to offer as we had check out early on Sunday due to the kids classes. 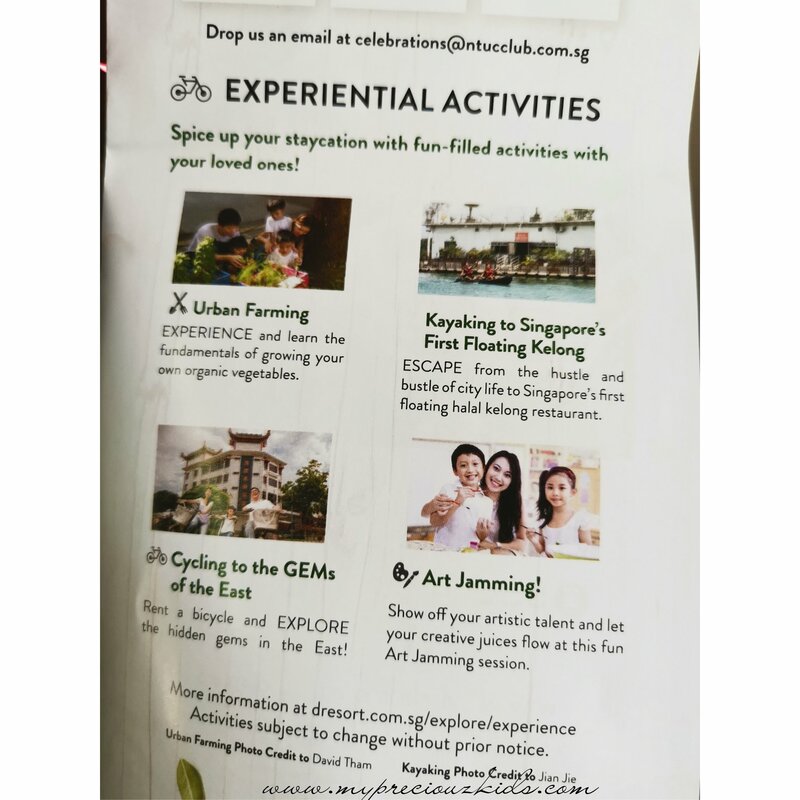 D’Resort also offer experiential experiences such urban farming, art jamming, kayaking to the kelong and cycling in the East which you can book while staying with them. 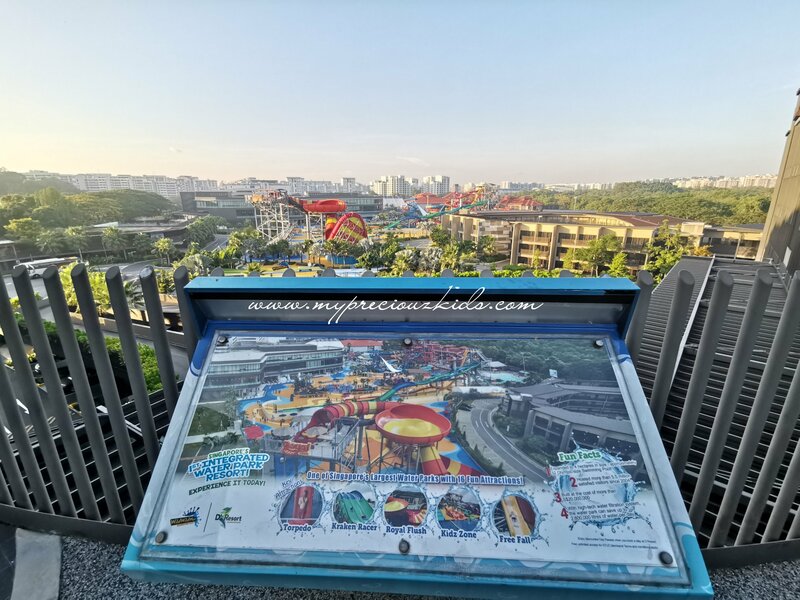 The deal is that you have to stay longer than 3d2n to enjoy it all as it was just too short and too many things to do at the integrated resort. 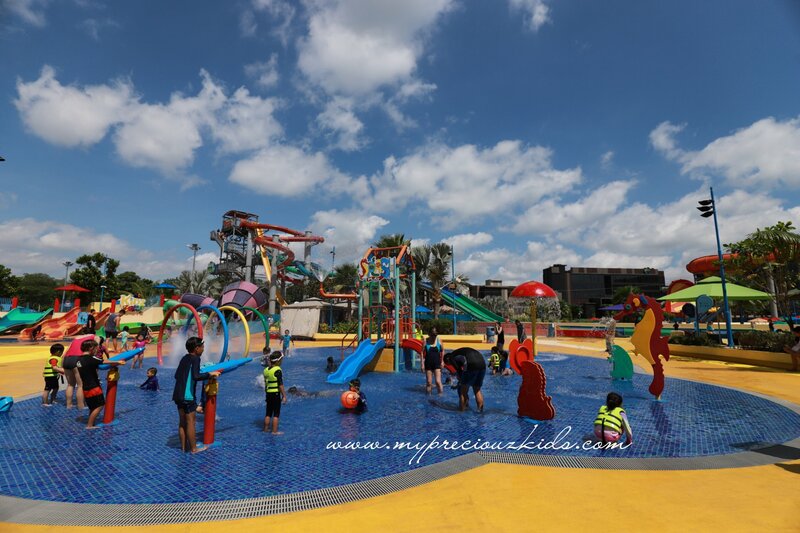 For the second part of the blog, I will cover on the many many many ( I can’t emphasise enough) activities to do while having your staycation at D’ Resort which of course includes what family with young kids do for kids who are not tall enough for the thrill rides at Wild Wild Wet and A GIVEAWAY of a family package to Wild Wild Wet in time for the March school holidays. For booking of rooms and offer and package, click here. 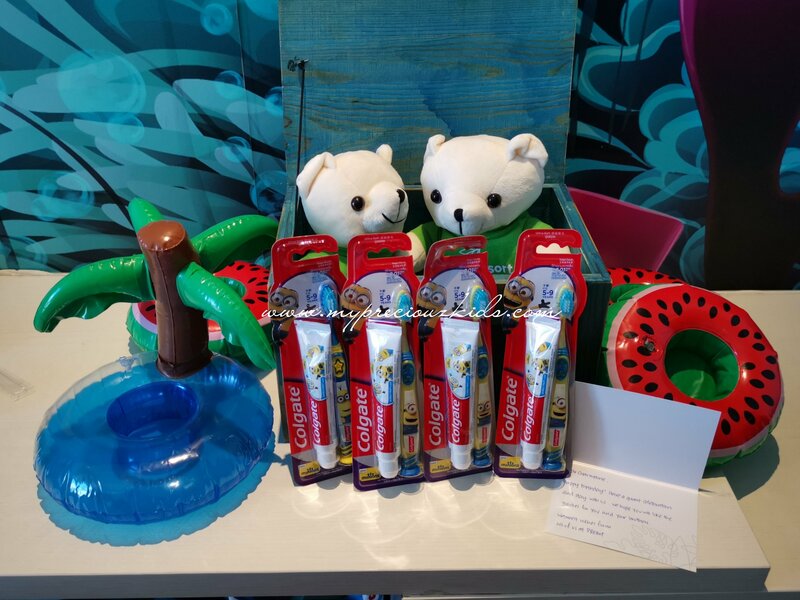 Do like and share this post on Facebook as one of the criteria for the giveaway on the next blog post. 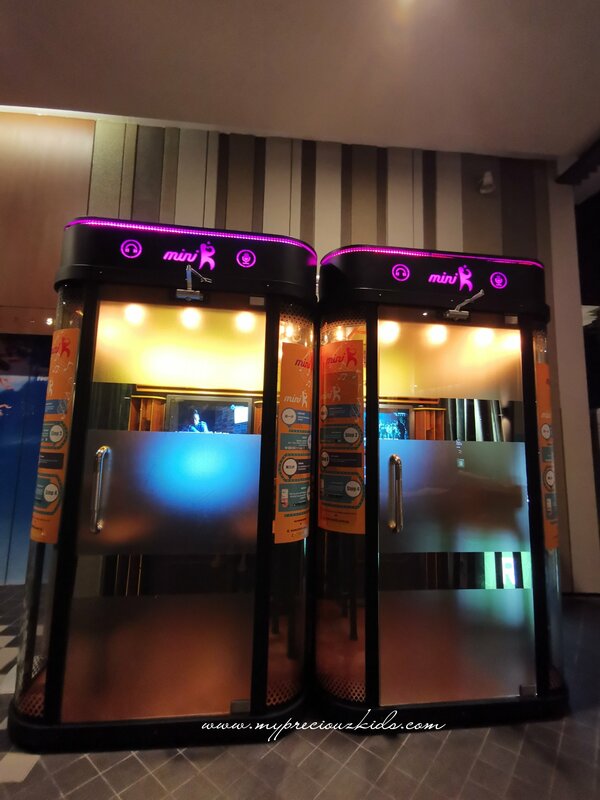 When I went to Seoul, I purposely booked tickets to watch Nanta. 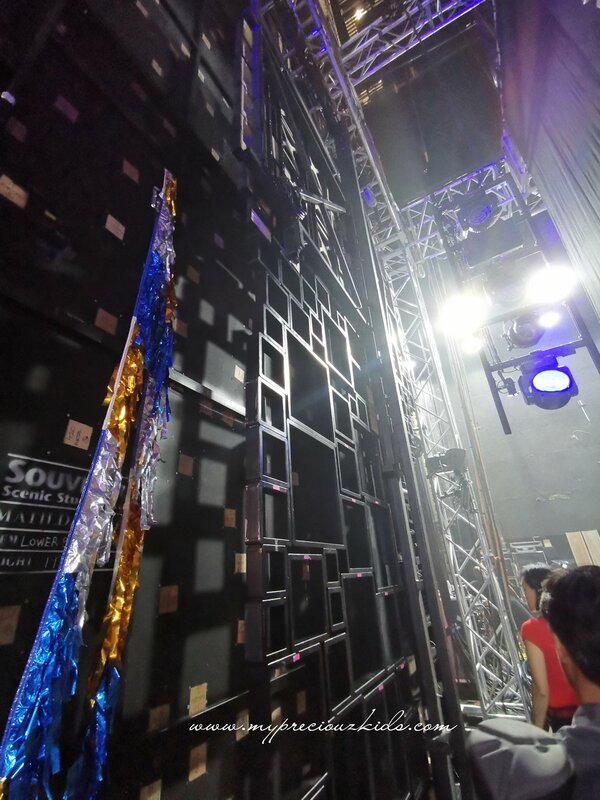 It was an awesome experience to watch the show from its originating place. 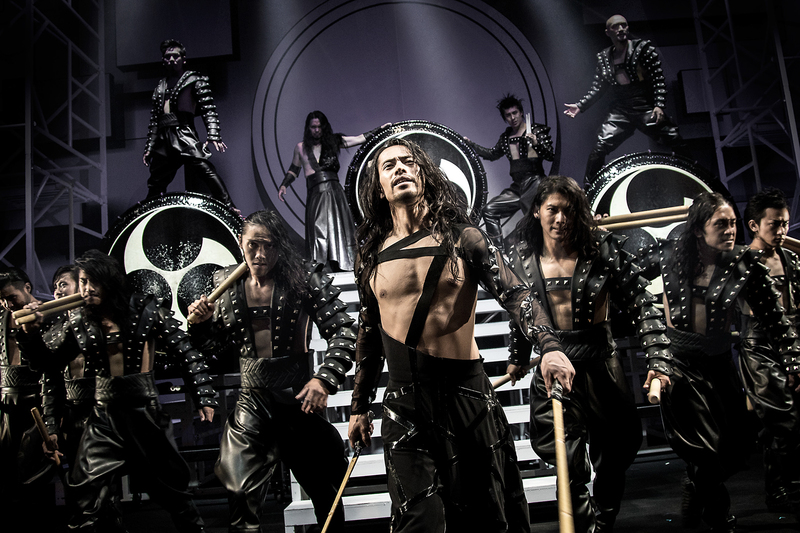 When I went to Japan last year, I was hope to put Drum Tao as a must watch but time wasn’t on my side and I didn’t manage to watch it unfortunately. I knew I had to watch it without me having to make another trip to Japan. You must be wondering how can a taiko/wadaiko drumming show last over 2 hour to entertain the audience. 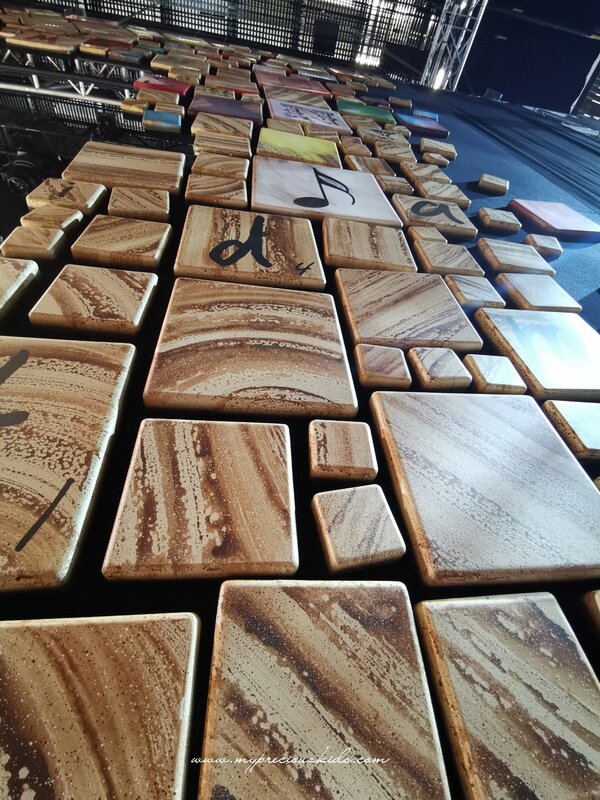 It’s not just non- stop drumming solely, there are a variety of drums and musical instruments and even martial arts performance. It’s really very interesting such instrument dating centuries back can remain relevant and popular. 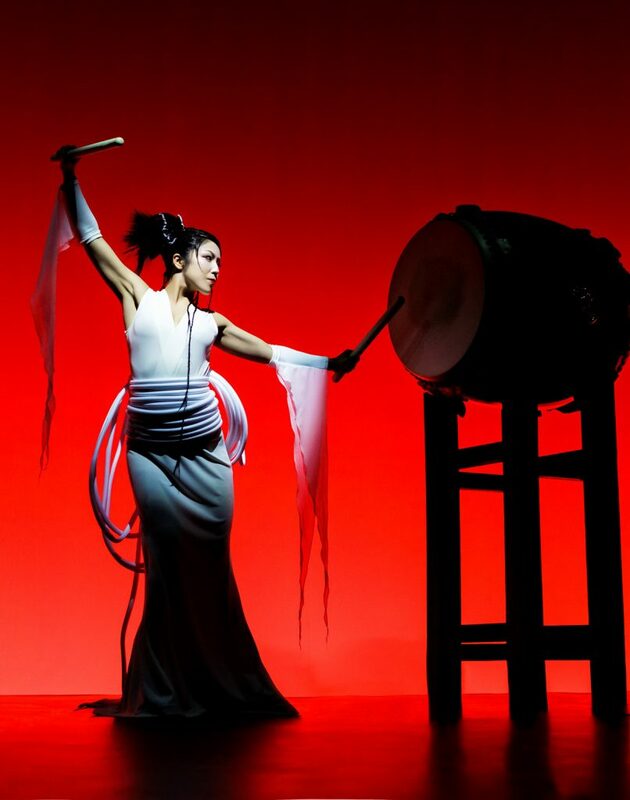 Drum Tao did just that – making taiko/wadaiko drumming contemporary and relevant to be enjoy by the current generation including families and kids. I brought 3 of my kids, especially for small J who has expressed interest in learning percussion drums. They have yet to attend such full length performance art hence I had some hesitation but my fears were unfounded. Even my 3.5 year old was entertained from start to finish in the 2 hour long show with intermission . The show started with a bang with an energetic number with the performers moving around on hover board. Thereafter, there were soothing and slow flute performances to bring down our heartbeats. It may not be a memorable one but its vital to keep the high and low of the show by picking up tempo thereafter . 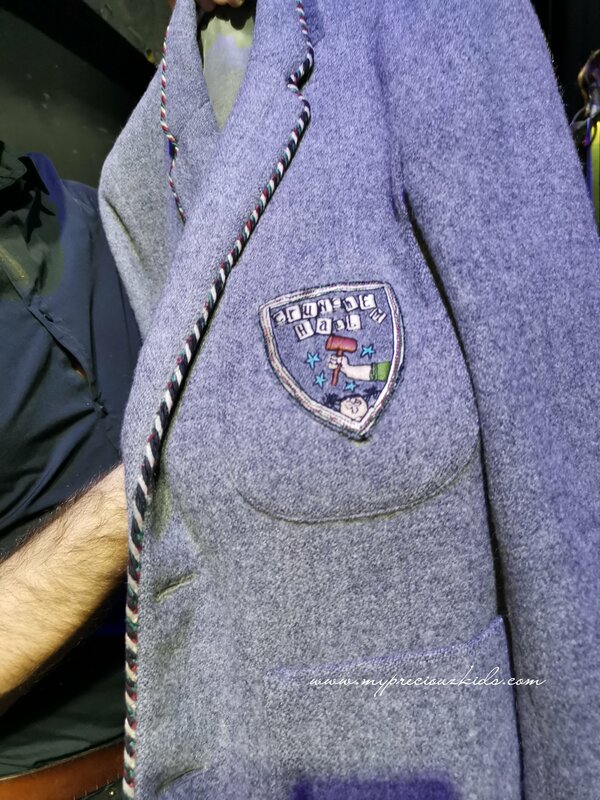 There were martial arts, somersaults, acrobatic acts and even comedy peppered throughout the performance. You have to watch it yourself to see why Drum Tao has been watched by more than 8 million people all around the word. At times, I was transported to Japan with old edo period and sakura as the background to some of the acts making me want to visit Japan again. Of course, the most awe-inspiring performance of them all was when all the performers crossed over to each other drums in perfect precision. These are some of the acts taken during the encore performance. 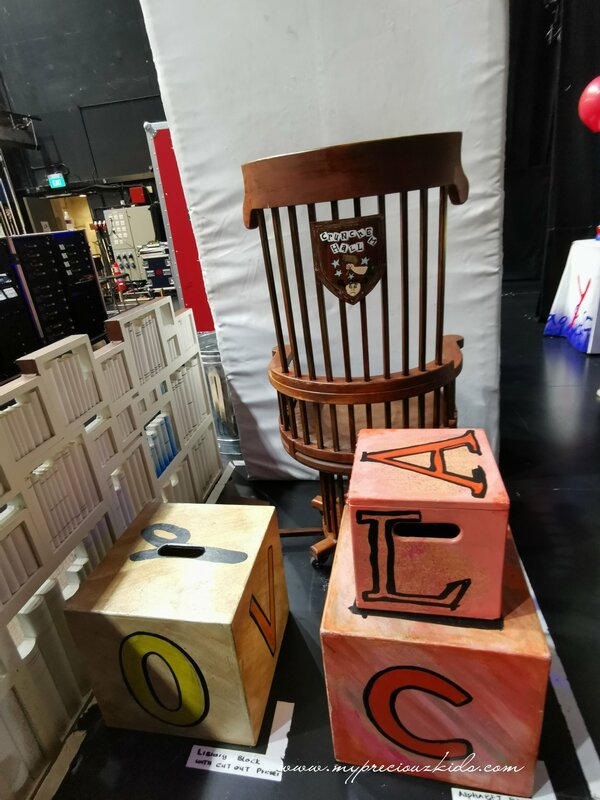 There are only 3 shows left this weekend, and if you are a lover of all things Japanese this is for you, if you are a music and performance arts lover this for you too (in fact I bumped into my kids performance art teachers there perhaps finding inspiration for the year end performance) . And if your kids who are fans of drums in particular , I don’t think there is a similar music extravagant like this. 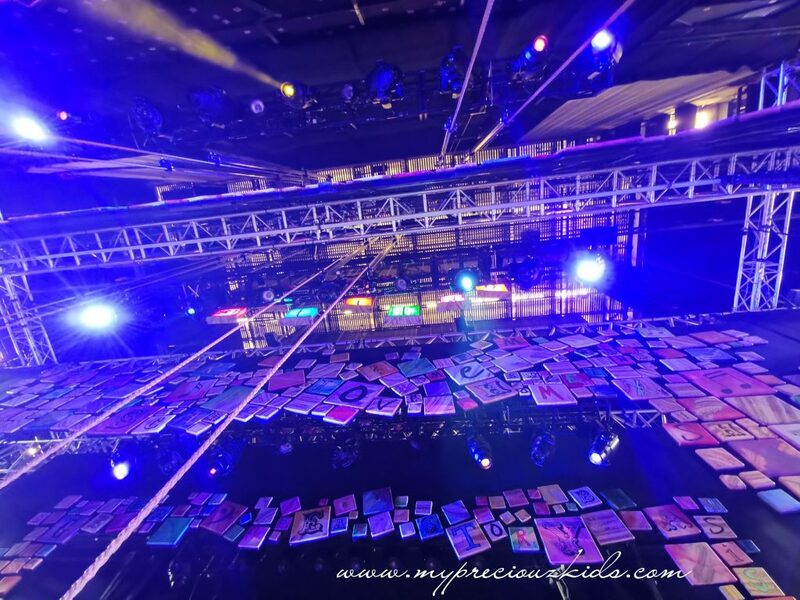 I was invited to the media preview and learned some interesting facts about this award winning musical. 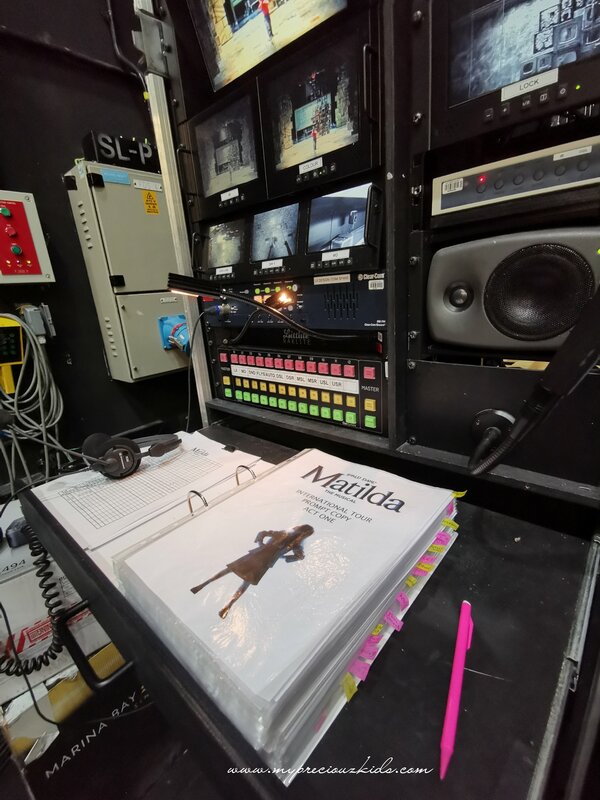 We were privilege to do a back stage tour with the stage manager. 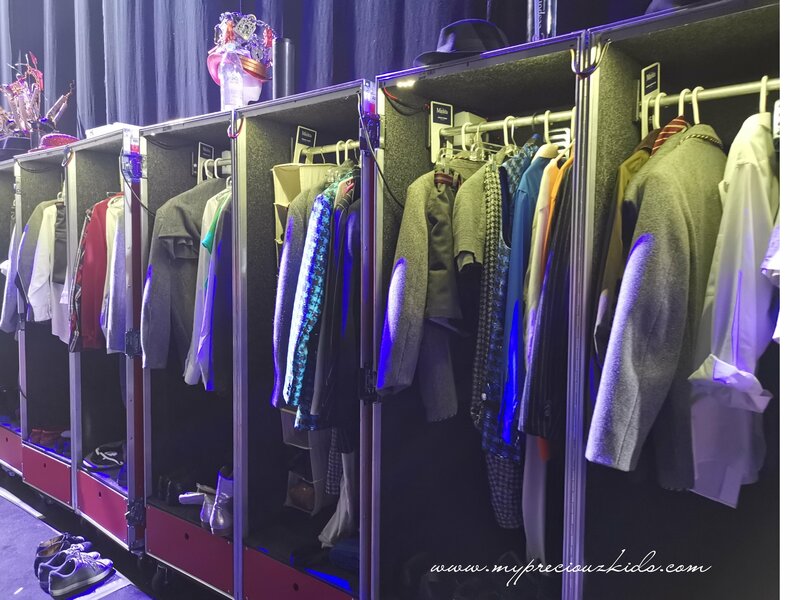 We saw props, wardrobe, costumes, and the back stage. 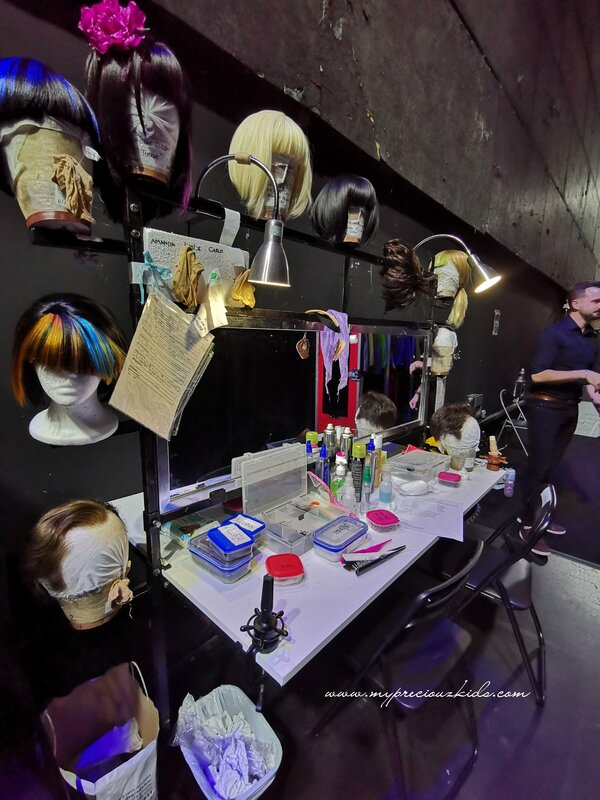 Here is a quick pictorial tour of the backstage which makes all the magic happens on stage. 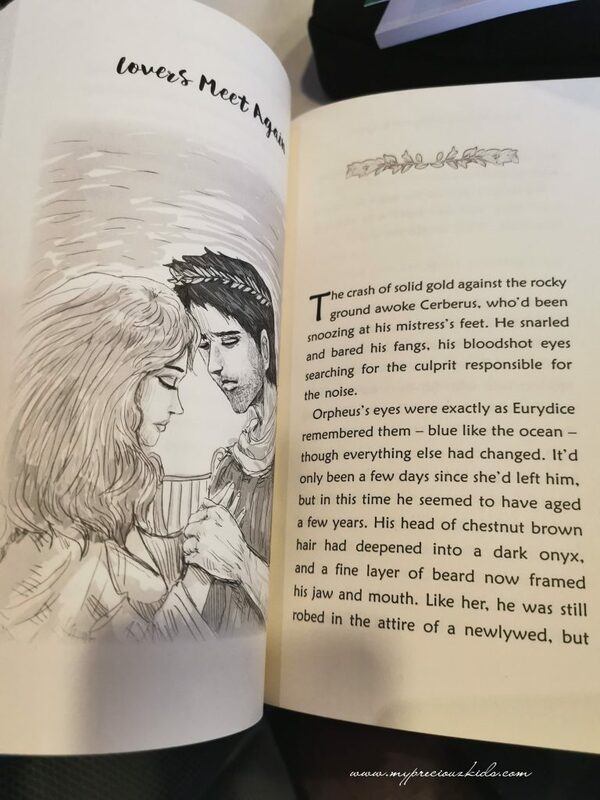 For my review, see my post here. 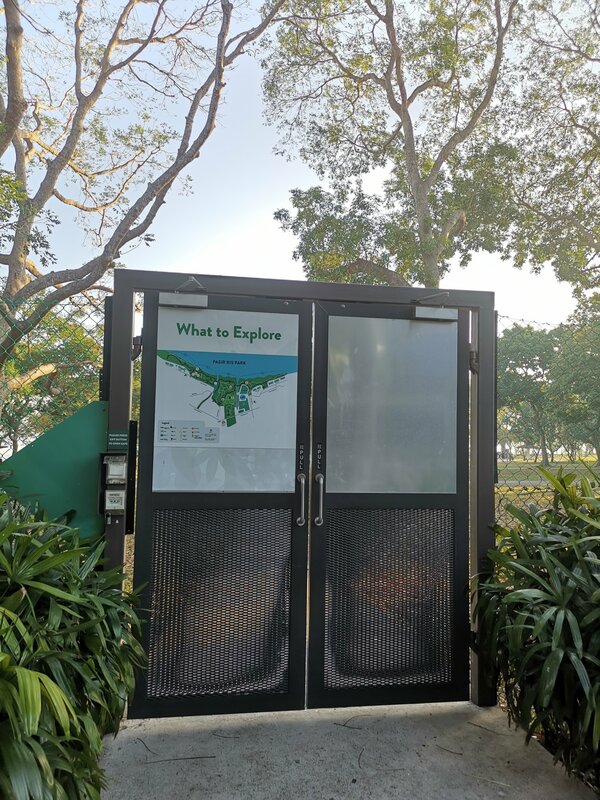 How fortunate are the kids in Singapore! 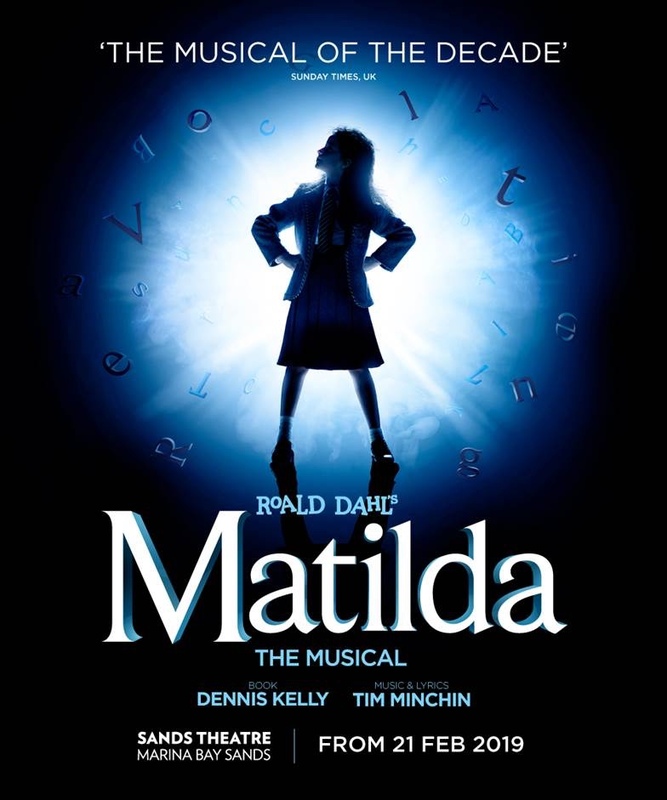 After last year’s all time favourite musical The Lion King , we are blessed again with another Broadway hit Matilda the Musical without needing to fly to London or New York. 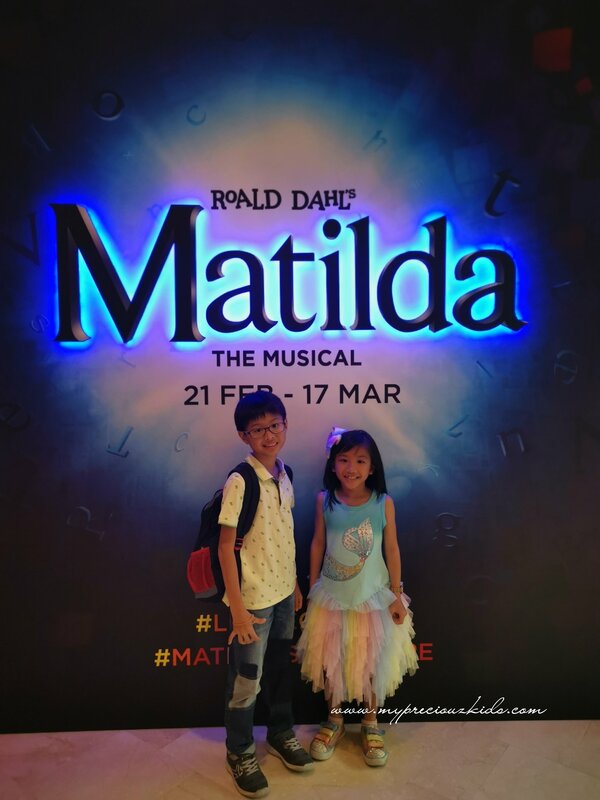 It is the very first time in Singapore and even Asia, and for Roald Dahl fans, you don’t want to miss the opportunity to see one of your favourite books come to live in an award winning musical. I actually watched the movie out from Netflix as I just couldn’t wait to catch the show and I must say the movie was actually very good after reading the book recently. 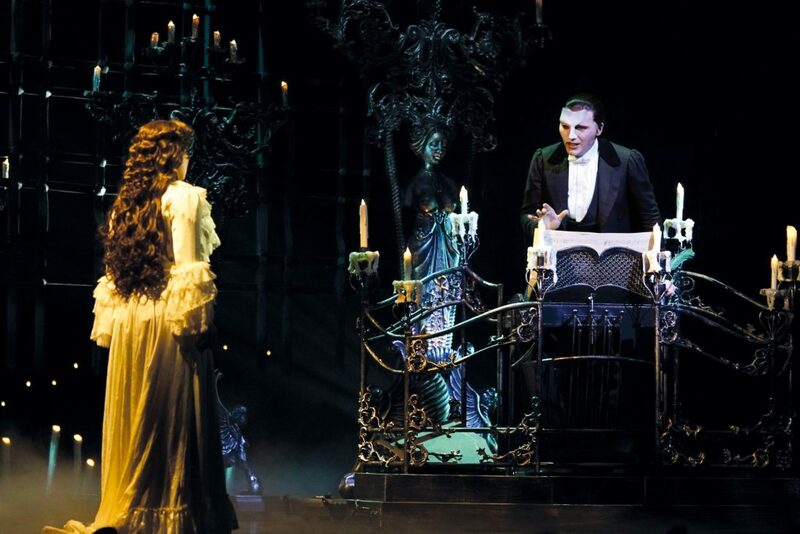 Watching a live musical is an entirely different level. 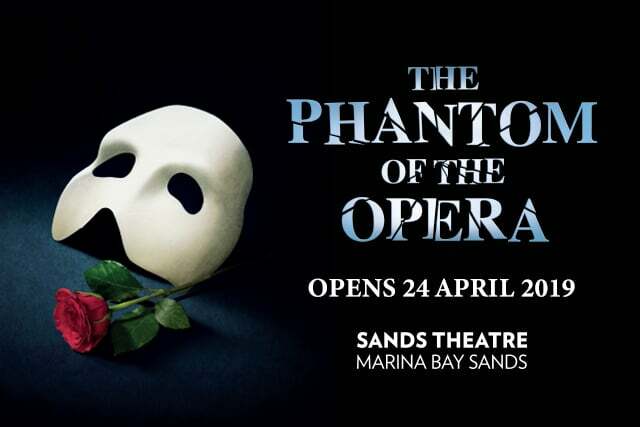 Albeit the pricey ticket prices especially if you have multiple kids, I am still one for the musicals. All good musicals are worth every penny and they don’t come by to our sunny shore that often. (The Lion King took 7 years become they came back). The musical does not follow the story line strictly, hence for those who has read the book or watch the movie, there are still surprises in store for you! 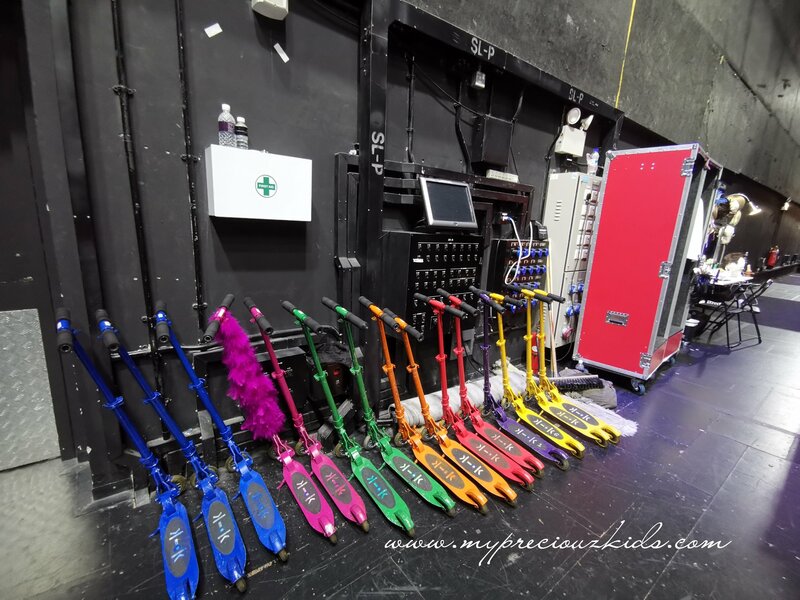 For some interesting facts about the musical and a pictorial backstage tour, see this post. Simple yet powerful and kids are able to relate to these messages. 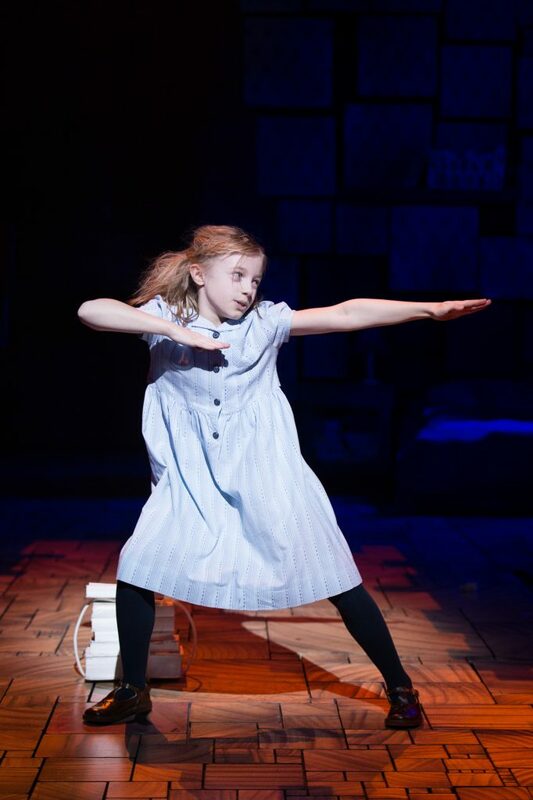 Matilda has used her voice, her intelligence and her courage to fight those who try to intimidate her – her parents and Ms Trunchbull. Yet she is overcame them by being even stronger in mind. 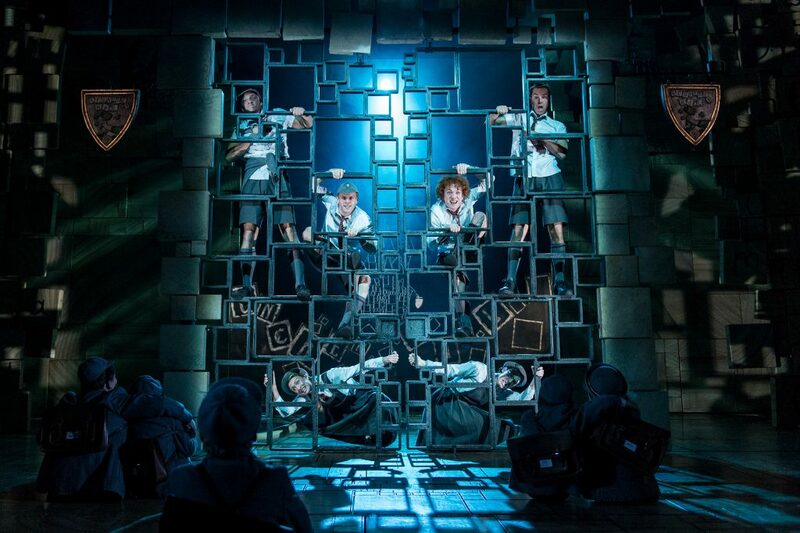 She fights for her rights and of those of her friends and Ms Honey despite being faced by a larger than life character in the form of her school headmistress, Ms Trunchbull. 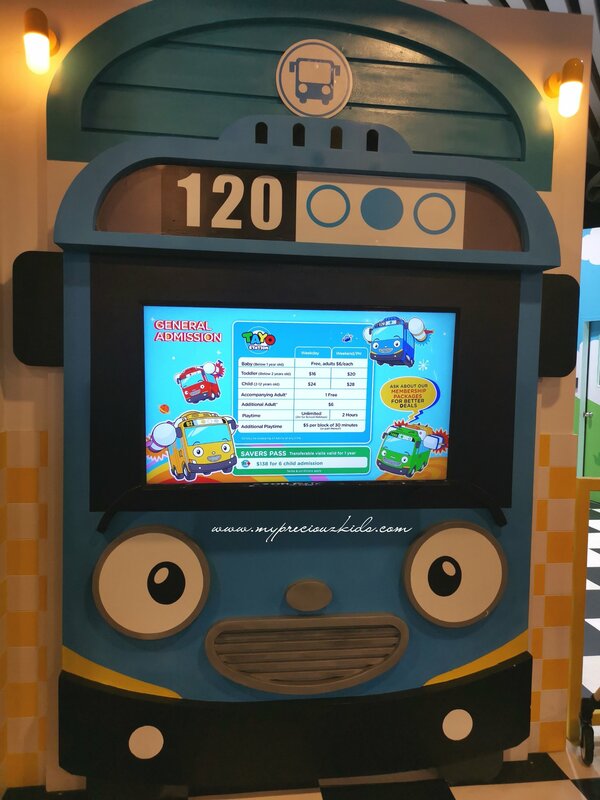 The music may not be as recognisable as The Phantom of the Opera or The Lion King but the tunes are so catchy and the kids can relate to the lyrics to them easily. 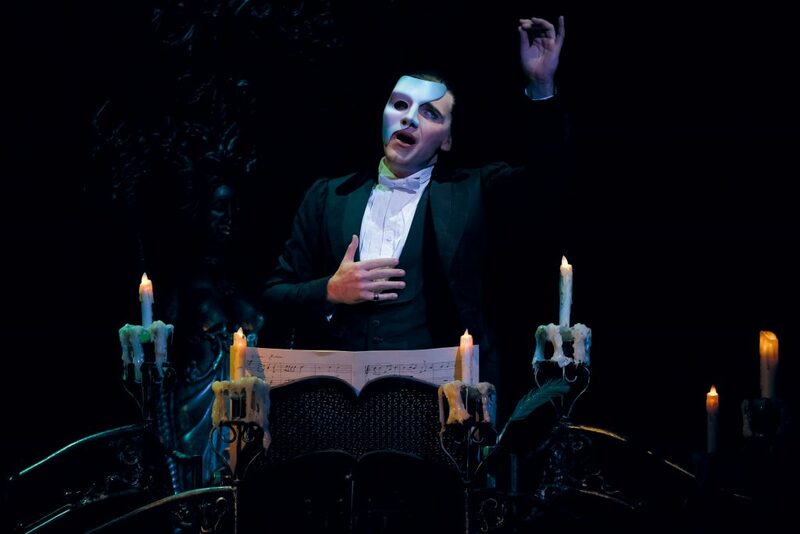 Even as I am hearing for the first time, I can definitely huming the tune of When I grow up and Revolting children after the show! Now it is in my spotify playlist. 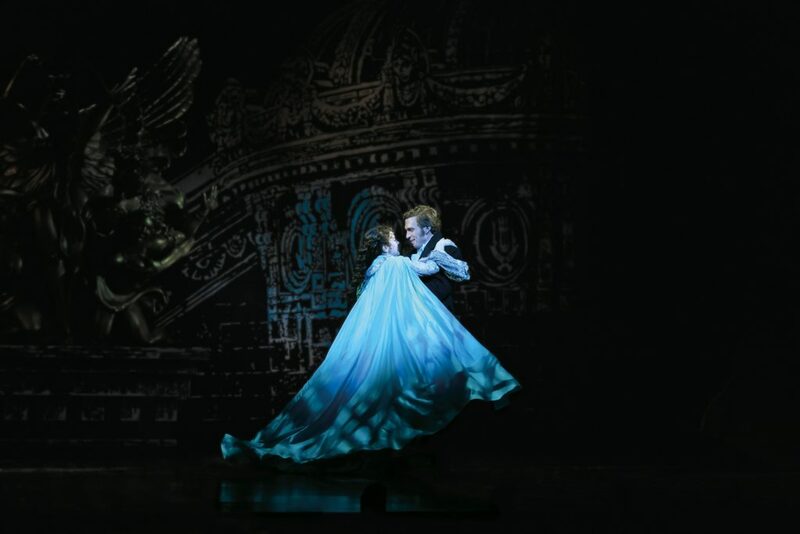 There were 3 SPECTACULAR acts in the musical which are magnificiently choreographed, totally world class! (won’t elaborate too much so as to not to create a spoiler) . 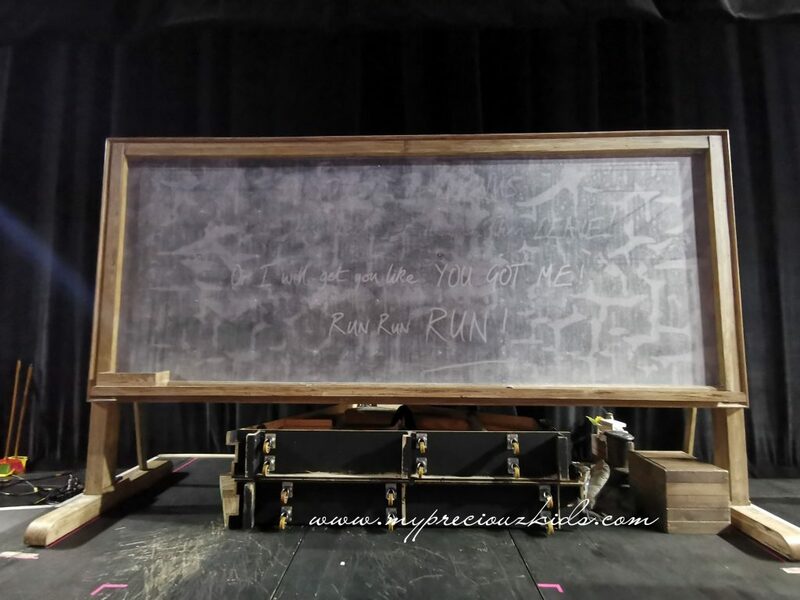 If I need to pay to watch the 3 spectacular scenes which were the one at the Crunchem Hall gate, the swing scene and the revolting children in the classroom again, I would! 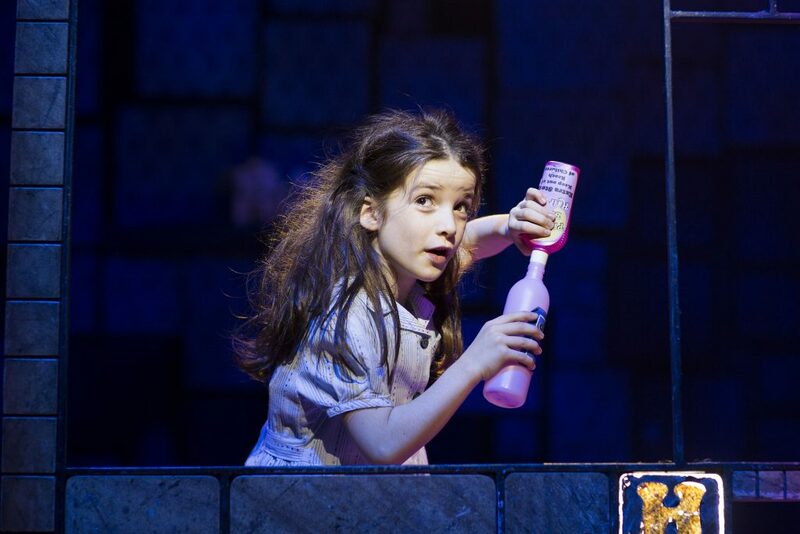 The musical feature a strong and intelligent female protagonist (fun fact: the shortest female lead in West End ). It is not very common to see such a strong and pint-sized female lead. 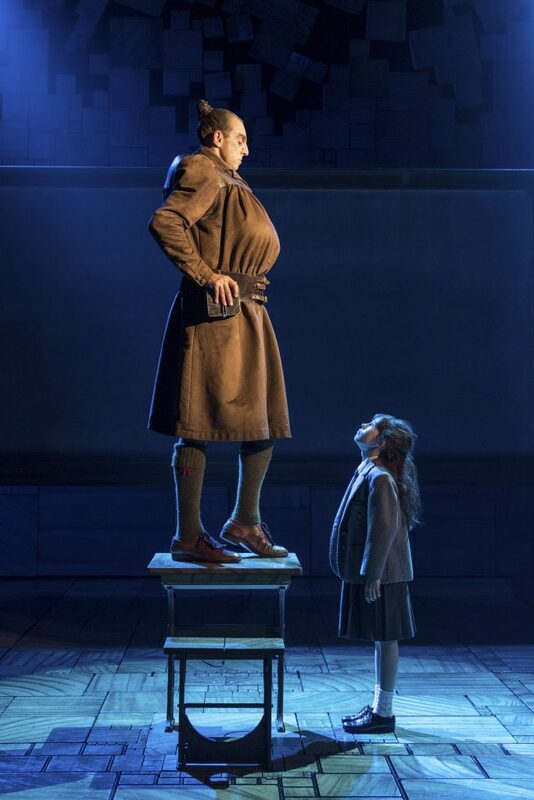 With the small size played by young talent instead of an adult renders the musical a bit more magic. 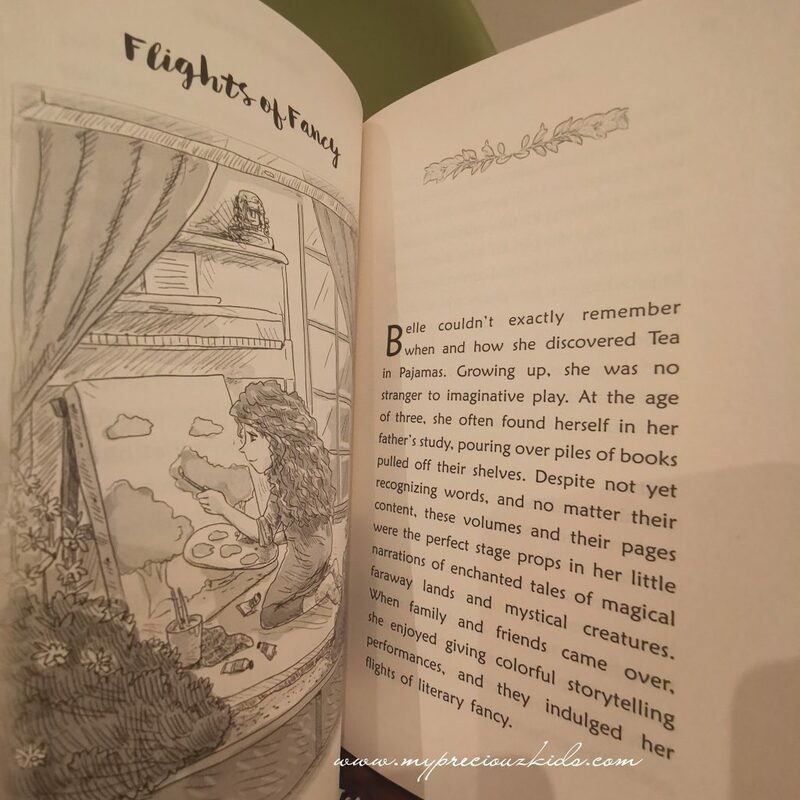 Messages that you’re never too small to stand up to bullies, there is magic inside all of us if we focus really, really hard, and that books are the most beautiful kind of love are seen throughout the show. 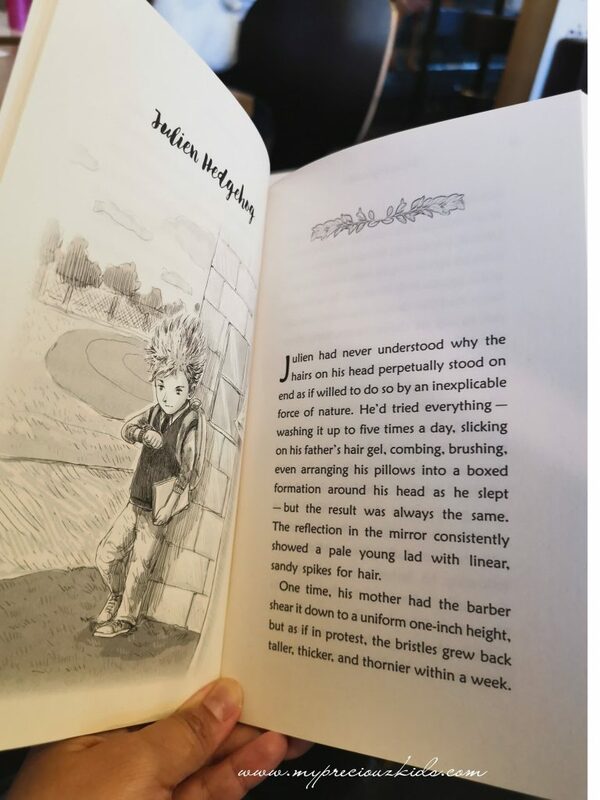 The only thing I must pre-warned you, the reason why my two younger kids did not follow along was they were very scared of Ms Trunchbull character in the movie (easily one of Roald Dahl’s scariest villains). 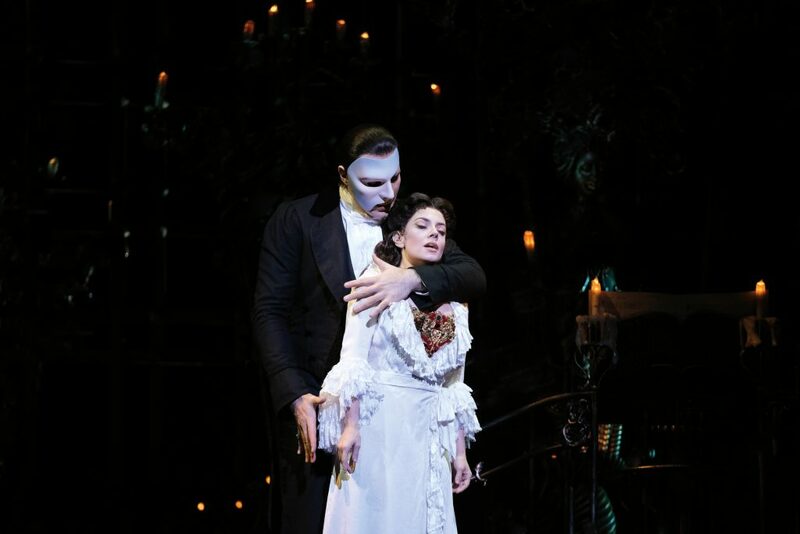 That said, I must say she is less scary in the musical, in fact she is verging on being comical at times and it is big J’s favourite character. My older two kids absolute love the story through and through. 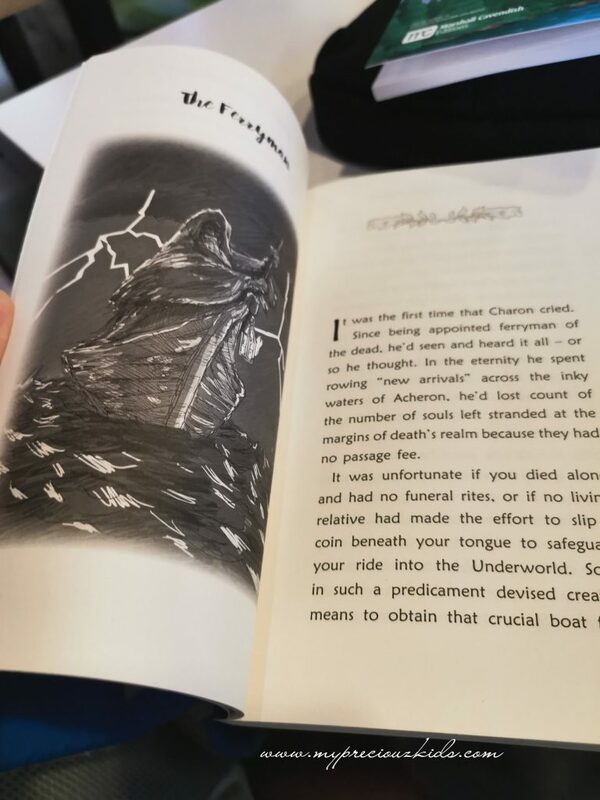 So I would say that is good from 6-ish year old onwards especially if they have been introduced to this very beautiful story from the master storyteller as they will be able to enjoy the story more. 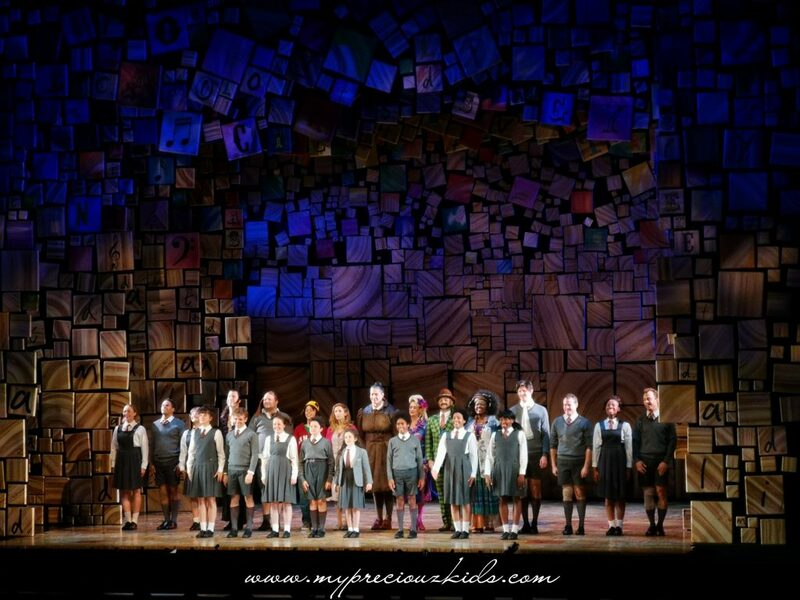 The entire musical last for 2.5 hours including a 15 minutes interval. 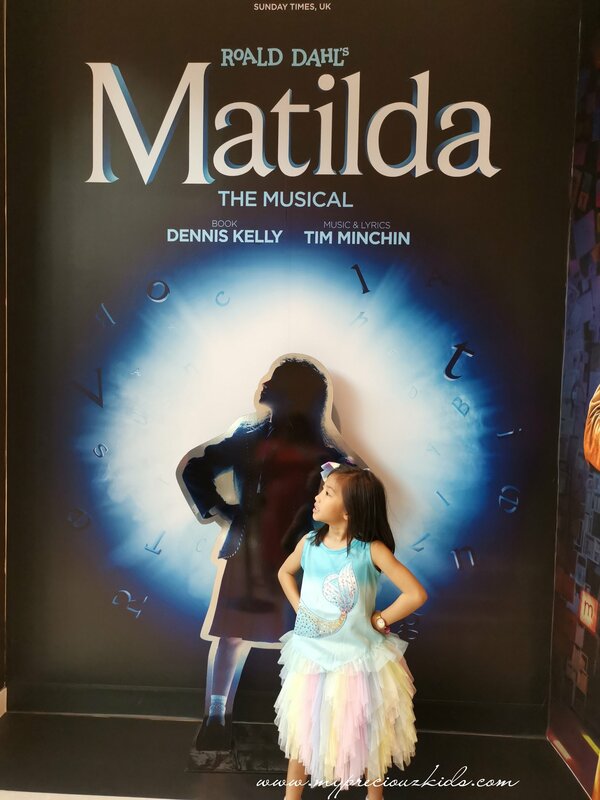 I have seen friends bringing kids to UK to catch Matilda the Musical but we are a lucky bunch thanks to Base Entertainment to bring the show to Asia for the first time and in particular Singapore. 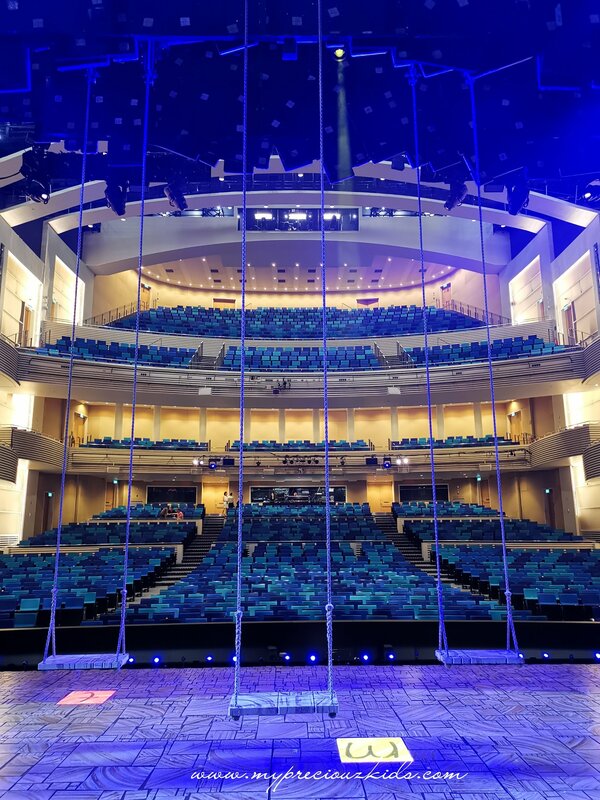 As I sat there at the Sands Theatre catching the musical, I am thankful I call Singapore my home, for having such beautiful venue to stage world class performances and for companies like Base Entertainment Asia which believe this musical will be well received in Singapore. In words of the CEO of Base Entertainment Chantal Prudhomme, she had watched it more than 5 times abroad and loved it every time she watched, and yes we loved it very much too and we got to watch this without having to travel abroad. 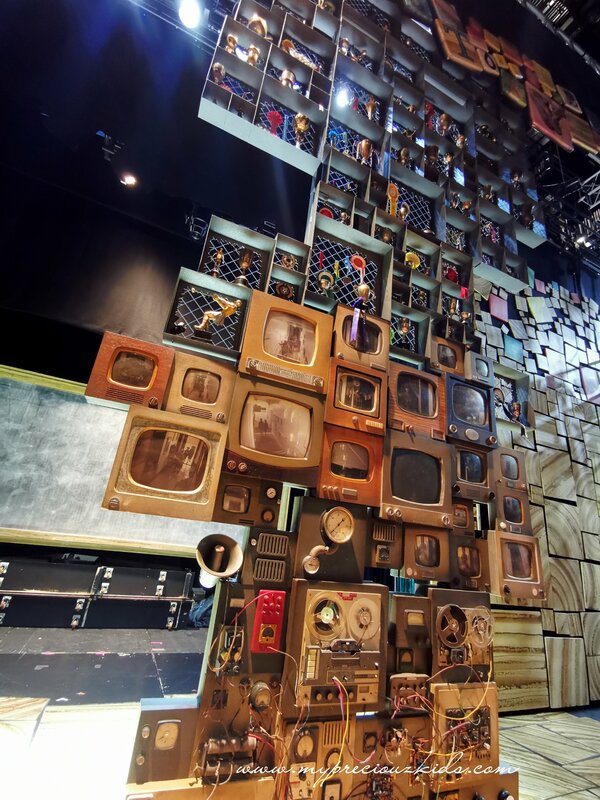 I think its the stories/musicals involving children are those that kids can relate and remember most in their childhood. I watched Sound of Music uncountable times during my childhood and remembered the show fondly. 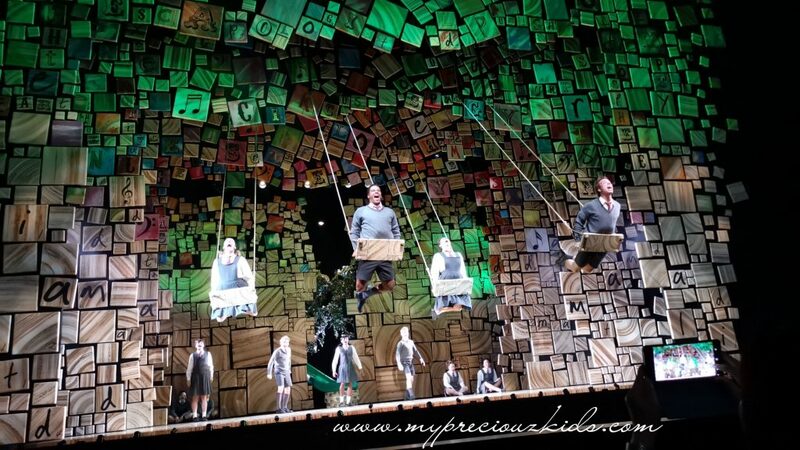 I believe Matilda the Musical has left a very deep impression in my kids’ childhood memories with the strong messages that is being sung throughout the show. 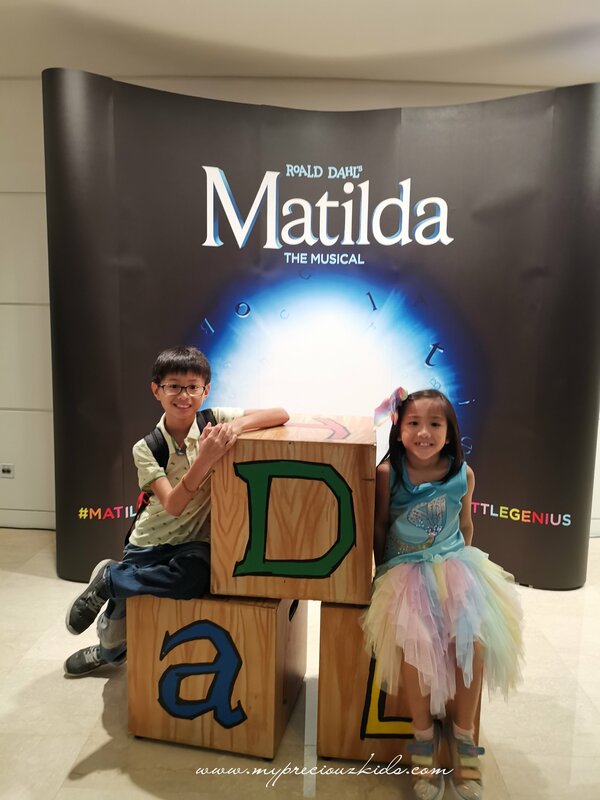 Do come slightly earlier as there are lots of photo ops around the theatre where you can do the Matilda pose and with the alphabet blocks seen throughout the show. 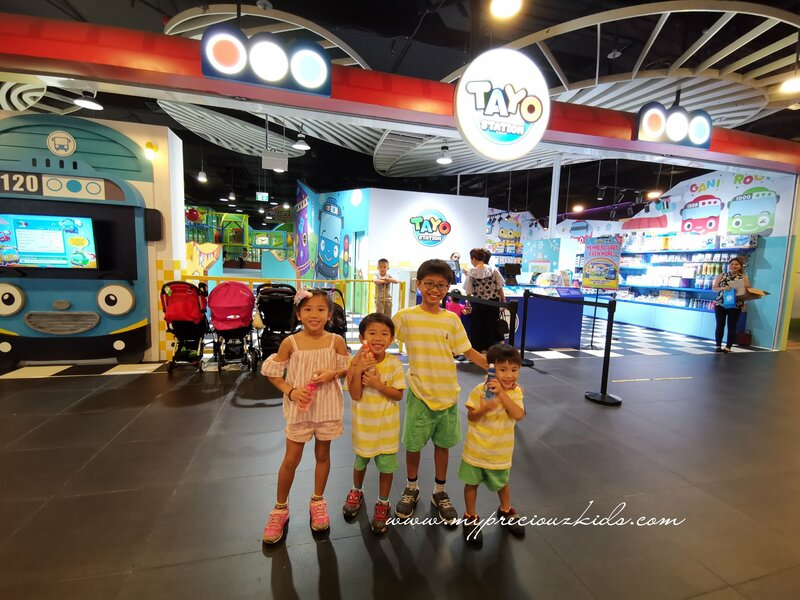 Even since Tayo Station opened last year, I have been wanting to bring my 4 kids down to check it out as my kids are huge Pororo fans. I always think that the distance is a hindrance to me. 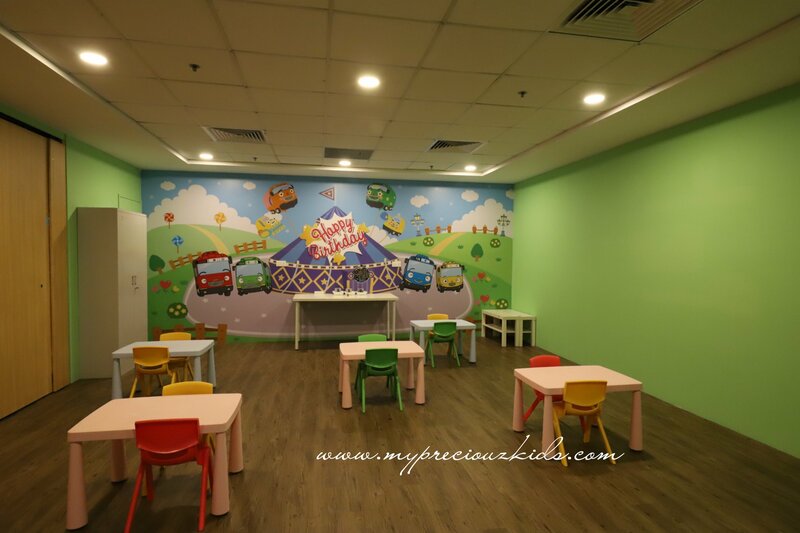 In fact, the number of times we actually went all the way to Downtown East is less than 5 times in the 10 years I have kids – twice for shows and once for an event (and we even stay in North East not even at the far west). 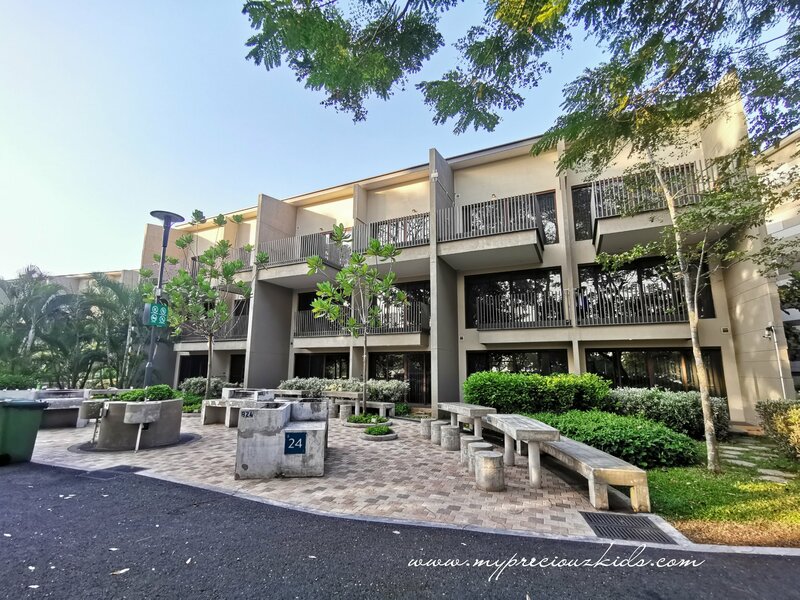 Since we are going to do a staycation at D’Resort at Downtown East which is located next to E Hub where Tayo Station is located , it’s finally time to include Tayo Station as the first item in the our itinerary especially it was so hot and humid when we checked in. On hindsight, after an awesome weekend staycation, frankly Downtown East is not so far – half hour from home but endless hours of fun, it’s not even crossing the border and praying there is no jam at the custom. 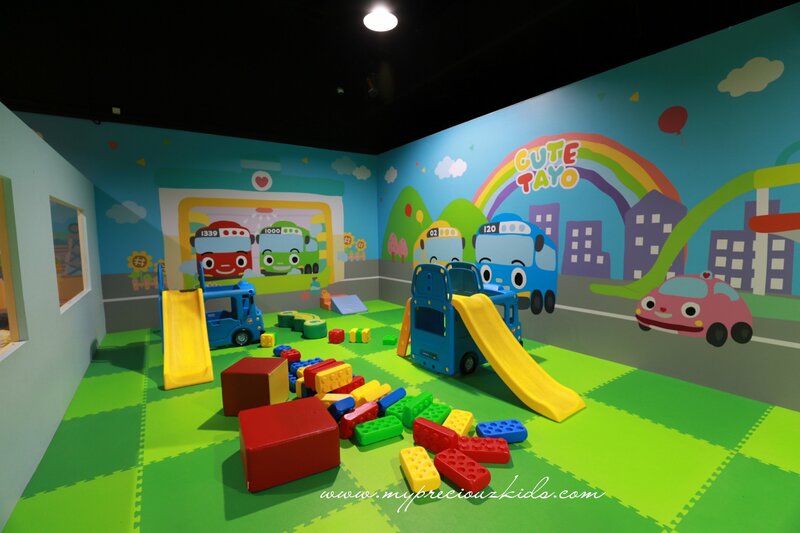 Tayo Station is themed around the South Korean animated series (Tayo The Little Bus) that follows Tayo and his little bus friends who often discover new sights and go on exciting adventures every day in the big city. 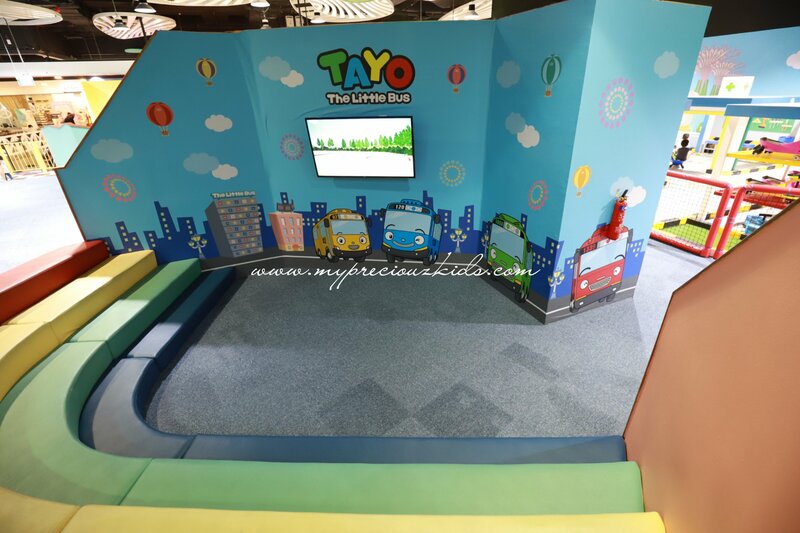 Tayo Station spans a massive 10,000-square-feet-space that integrates indoor playground attractions, edutainment area and sensory play space for young children from 1 to 12 years old. 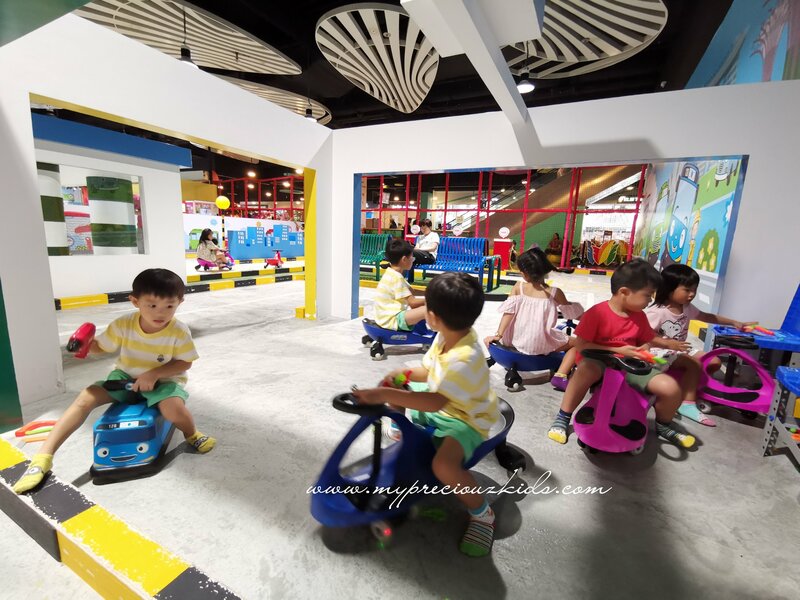 The highlight and uniqueness of Tayo Station on top of being a themed play gym was the very good size road circuit. 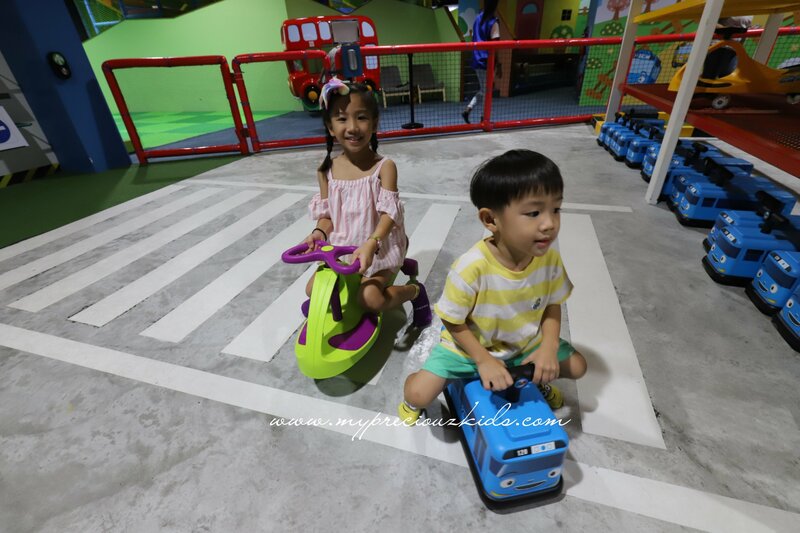 My kids are big fan of the Road Safety Park at ECP as they can indulge in pretend play. This is the same but in air-conditioned comfort. 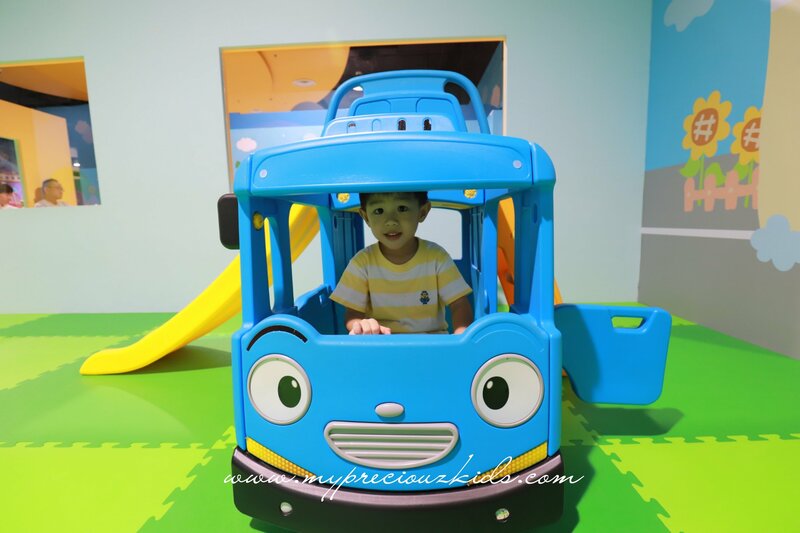 Complete with a “big garage” of “cars” – Tayo Bus ride-ons (below 3) and also wiggle cars (older kids and even for adults below 80kg). 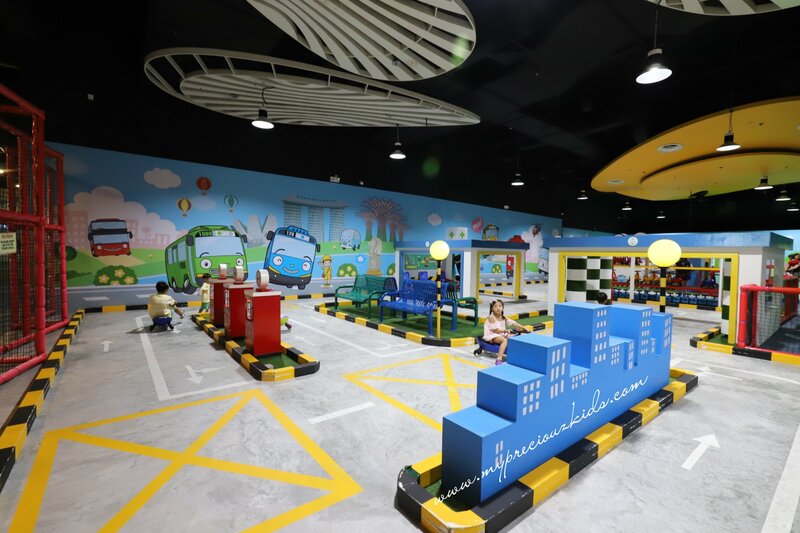 It is a very good size two lanes circuits complete with lots of pretend play areas – workshop, car wash, petrol station. 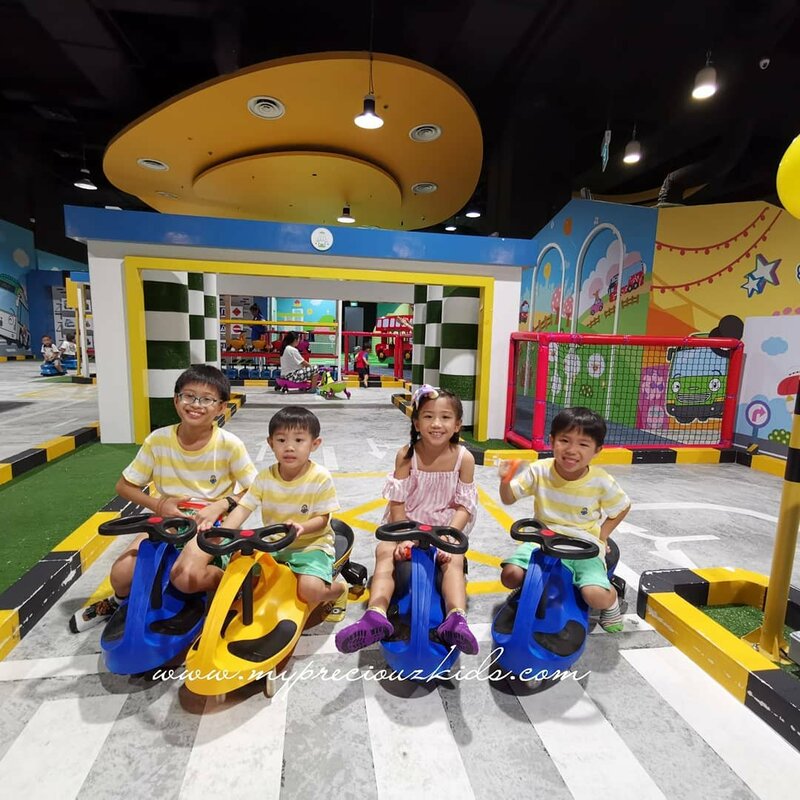 In fact the kids spend the most time, even the going to be 10 year old had so much fun playing the circuit with his siblings. Even I had a go at the wiggle car as it was not crowded on a Friday evening. Typically on peak/busy period only parents for younger kids are allowed into the road circuits to supervise the kids. 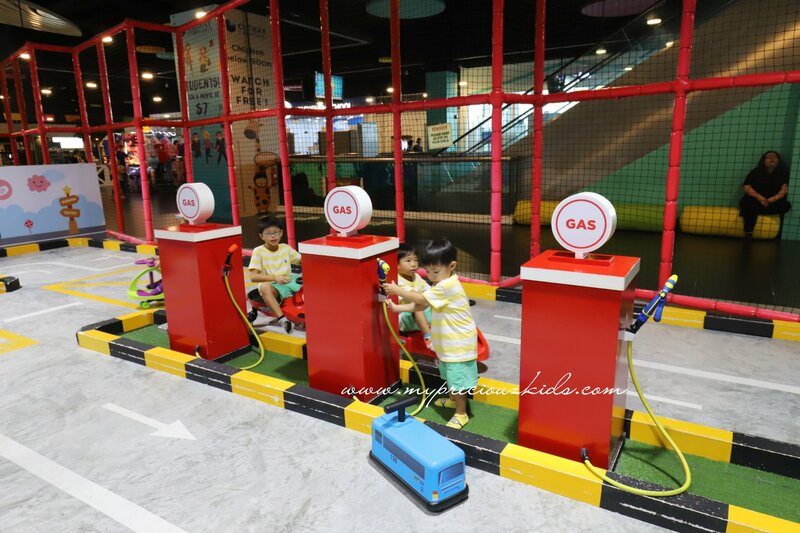 The kids had so much fun indulging in pretend play like adults driving cars on the road, going to the workshop, car wash or even pumping petrol. There is also a zebra crossing area complete with a working traffic light! And there were also playing police chasing thief etc. Thankfully, its not crowded on Friday afternoon hence they played to their hearts’ content. 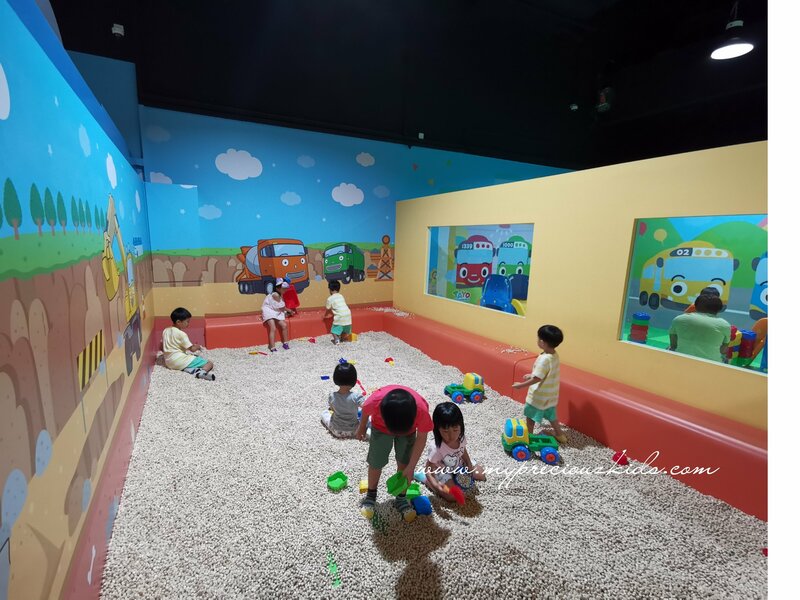 Hinoki bead area – another area where the kids had fun being snow angels, pretending to be at the beach, perfect for younger kids’sensorial needs. 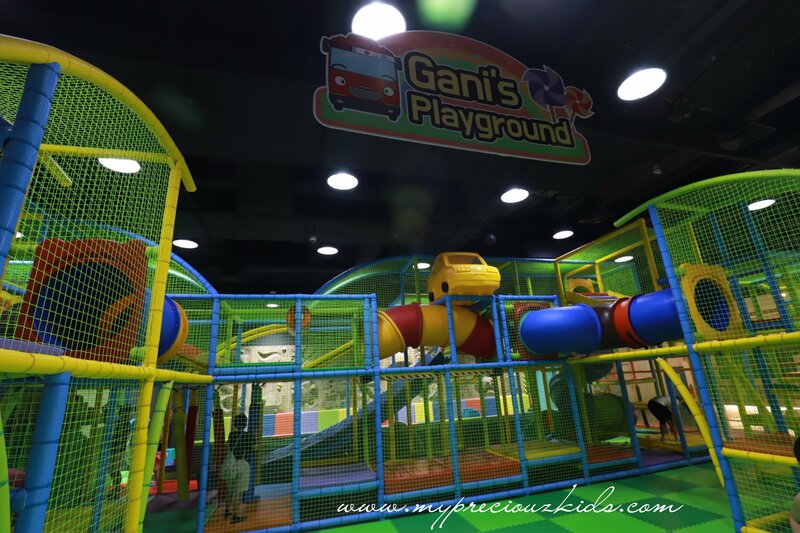 As in all gym, it is not complete without a ballpit or a play gym structure named after Gani. 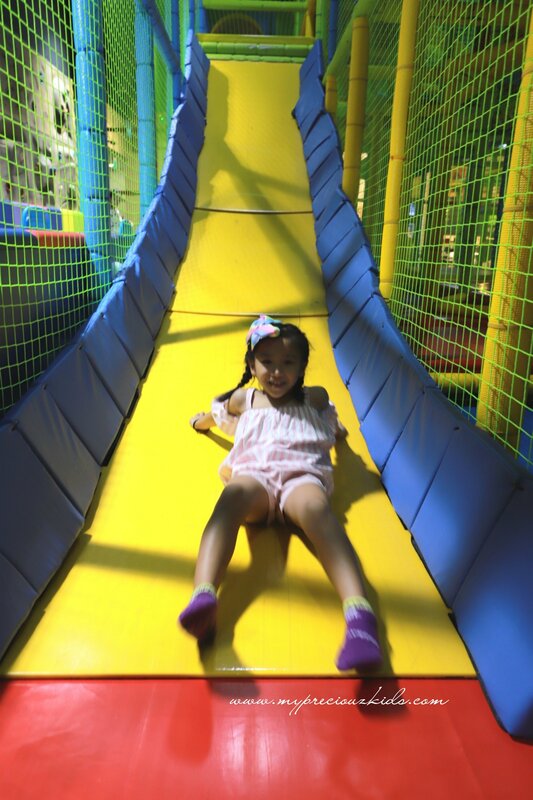 There is a toddler area with soft blocks and slides. 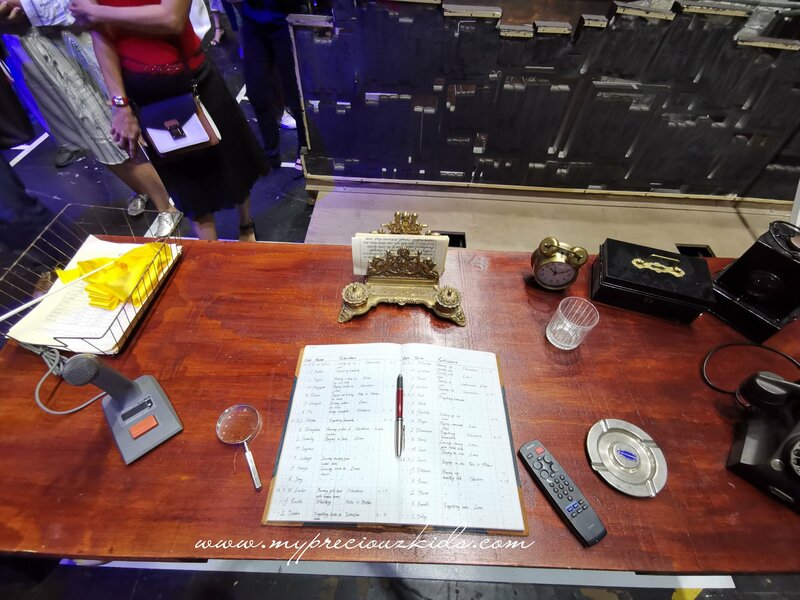 There is also an area for fans for Tayo to watch the show and rest. And a good size snack area complete with vending machines which are stocked with hot drinks, snacks and ice creams. 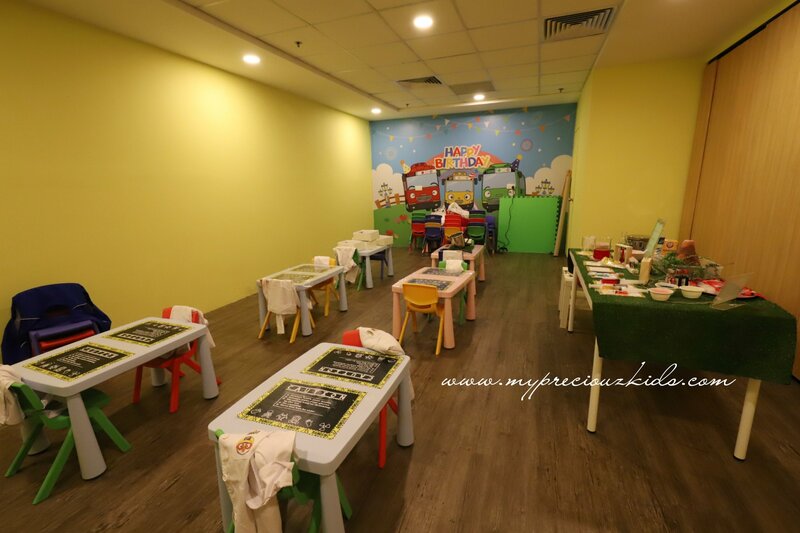 For parents who wish to organise birthday parties, there are two parties rooms to choose from and two affordable packages to choose from. For add-ons, see more details here. 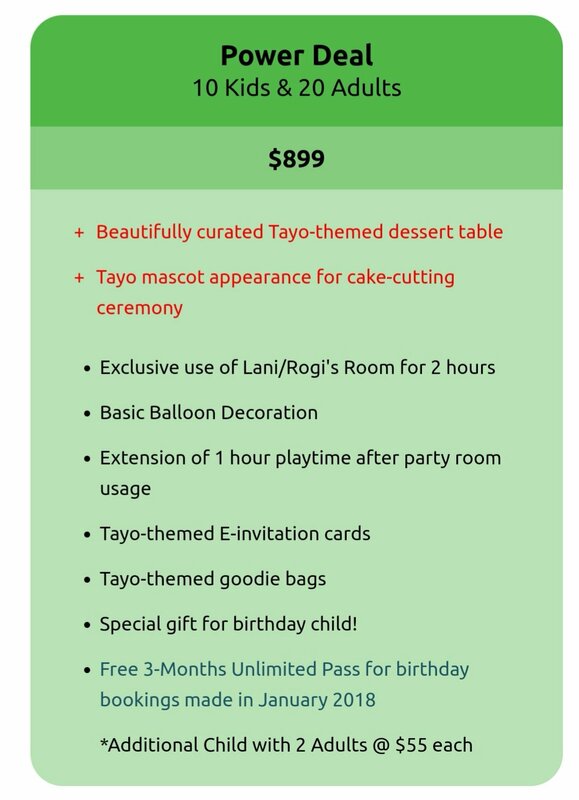 Lastly, there is also a themed gift shop complete with Tayo toys and even Pororo toys at the entrance for all the Tayo and Pororo fans. 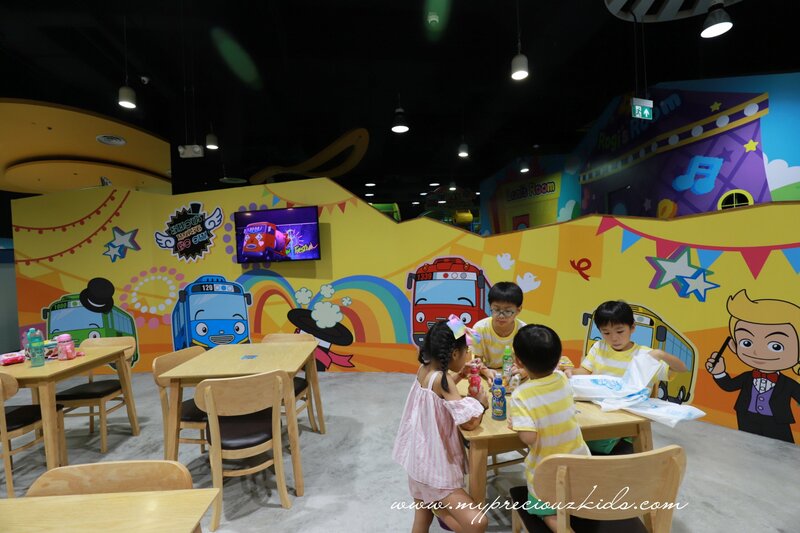 Tayo Station has been designed for kids below 12 years old. I thought it may too kiddish for my soon to be 10-year old but my worry was unfounded. 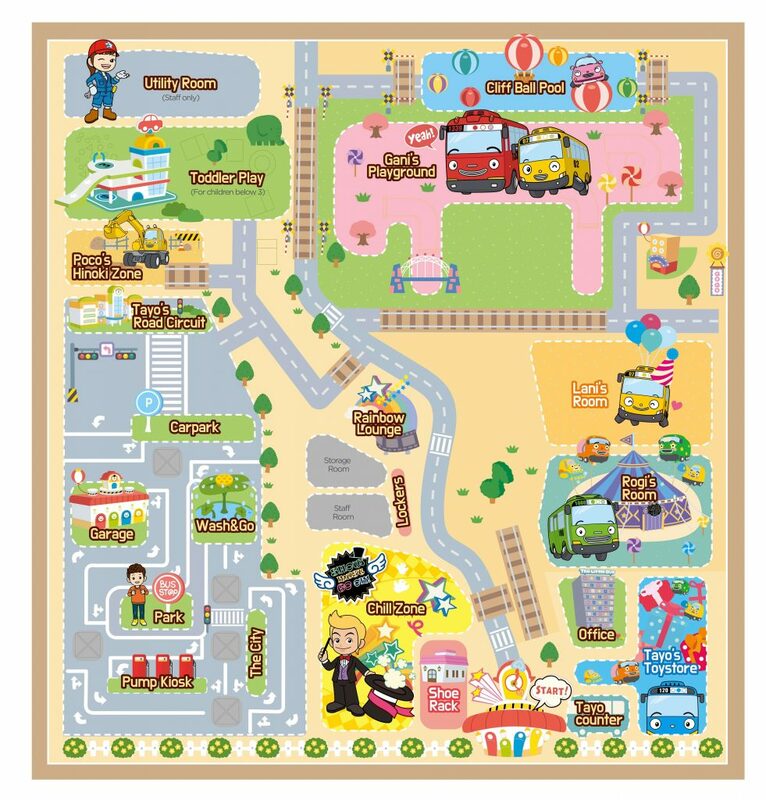 In fact, as there was no crowd on a Friday afternoon, I myself tried the wiggle car and had great fun with the kids at the road circuits. 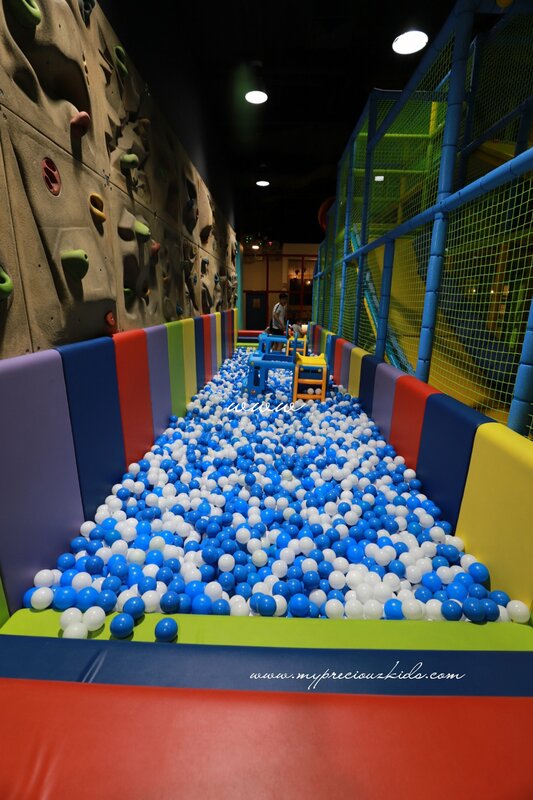 (Parents are normally allowed for kids below 5). Of course the younger ones had the most fun as I lost them the minutes they took off their shoes. 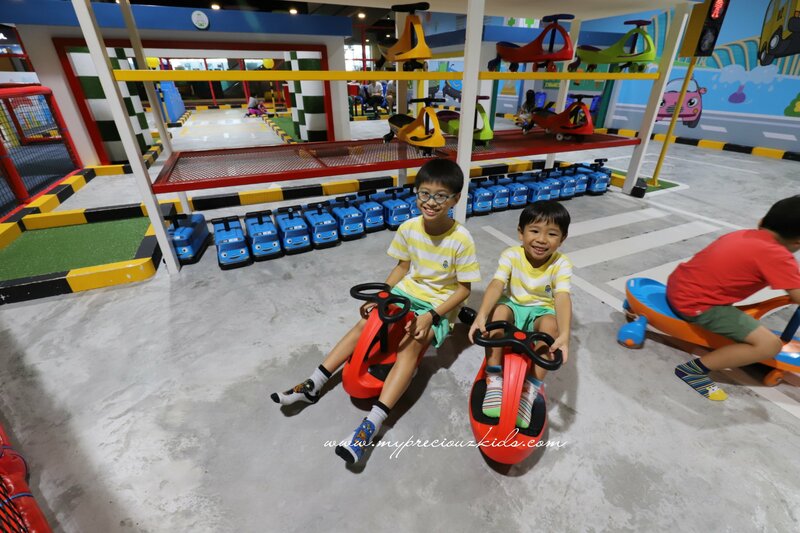 In fact, throughout our staycation , the kids had been incessantly asking to go back however we were so packed with activities hence it calls for a visit in due course. 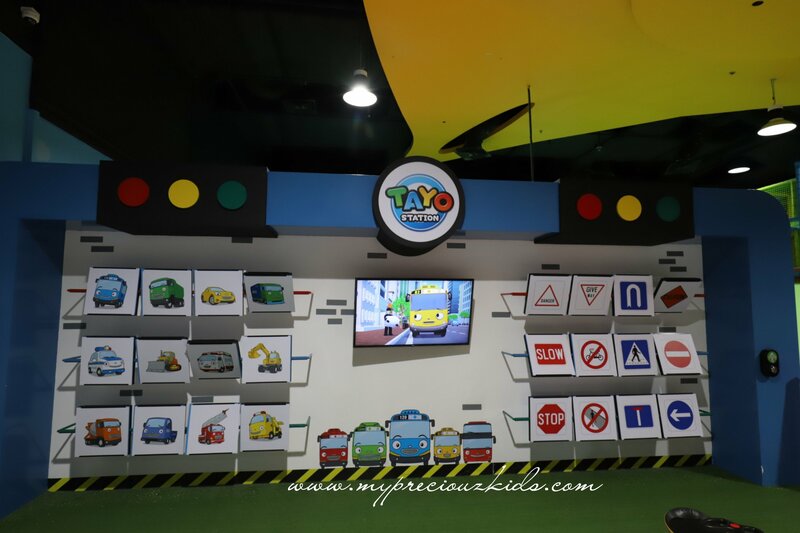 In fact, Tayo Station has lined up many activities for the March school holidays, do check out their website and social media for their upcoming activities. 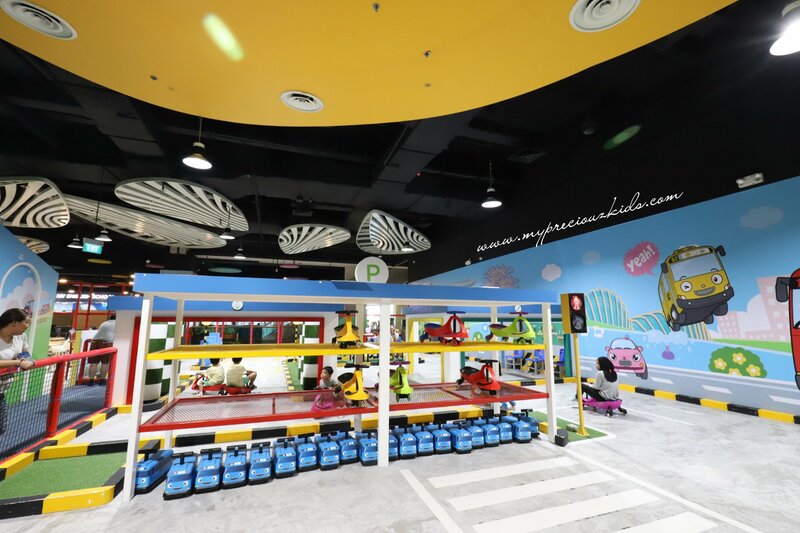 So for fans for Tayo the little bus or kids who loved road circuits, (I don’t think there is any playgym in Singapore that boast such a nice and big road circuit, Tayo Station is really worth checking out even if you have to drive all the way from the west to check this out! 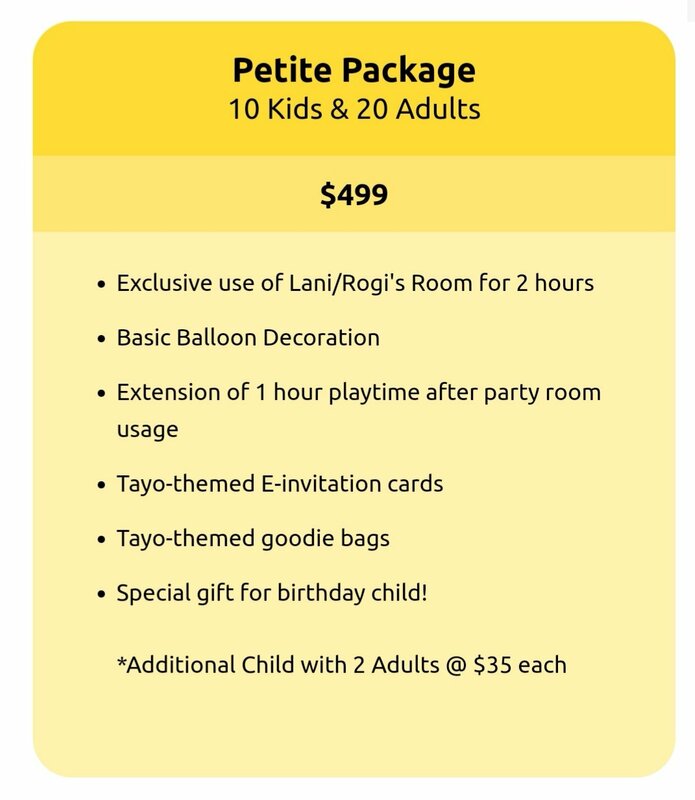 Tayo Station has kindly sponsored 2 sets of membership (worth $56 each) Each membership (inclusive of first free child admission + 1 adult) is worth $50 and including 1 science week activity – worth $6 . 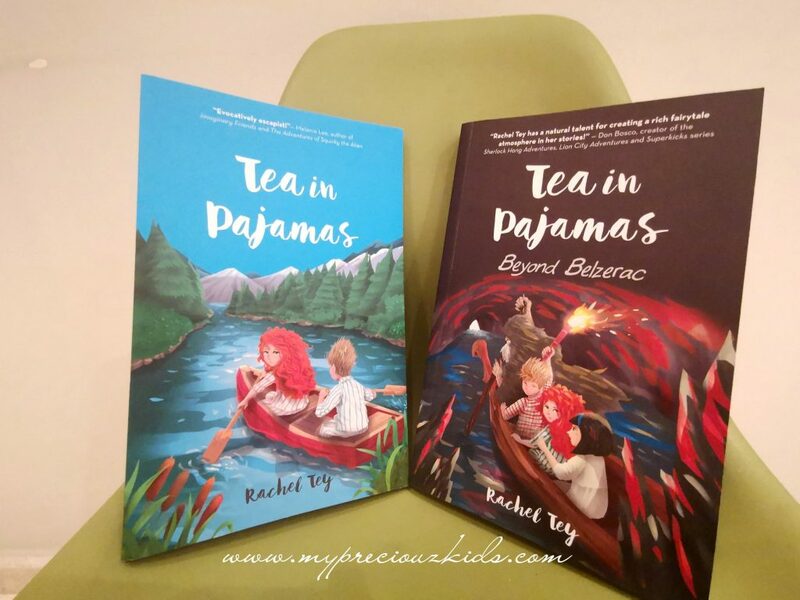 Giveaway ends 10th March 2019 Sunday 2359. Taiko drumming is a Japanese culture that dates back to many centuries ago. How often do we have a cultural performance being improvised for modern society entertainment and embraced by the current generation to huge popularity. 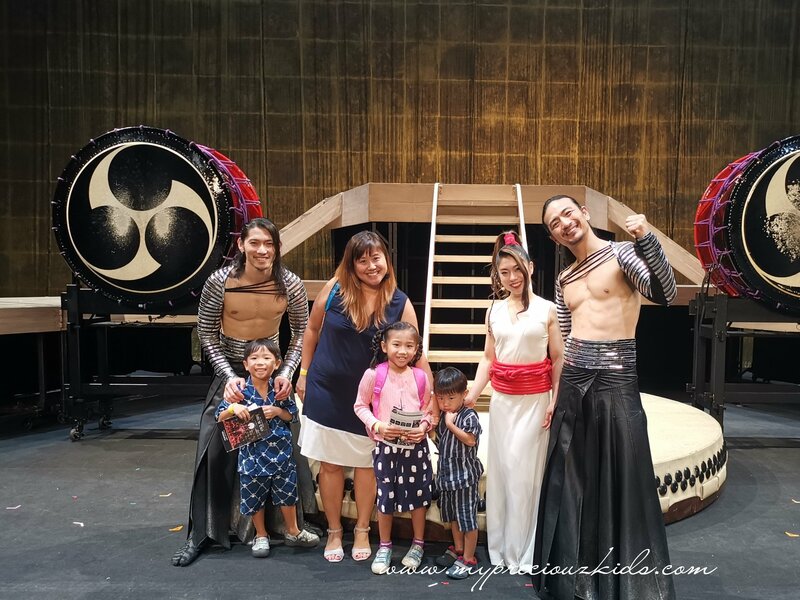 We didn’t managed to witness first hand during our trip to Japan last year, so we are extremely fortunate to be able to catch Drum Tao in Singapore and only for 4 shows! 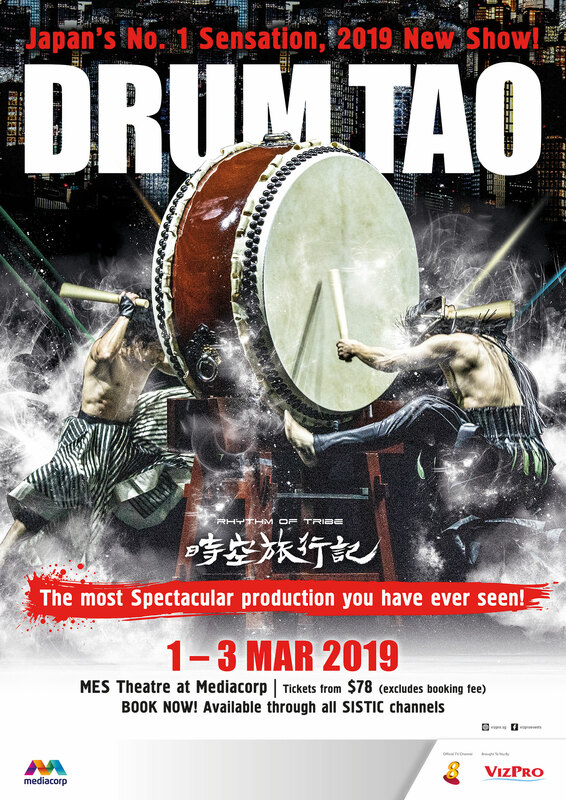 World renowned Japanese martial arts and drum extraordinaire, Drum Tao, will be back for a spectacular brand new production early next month. 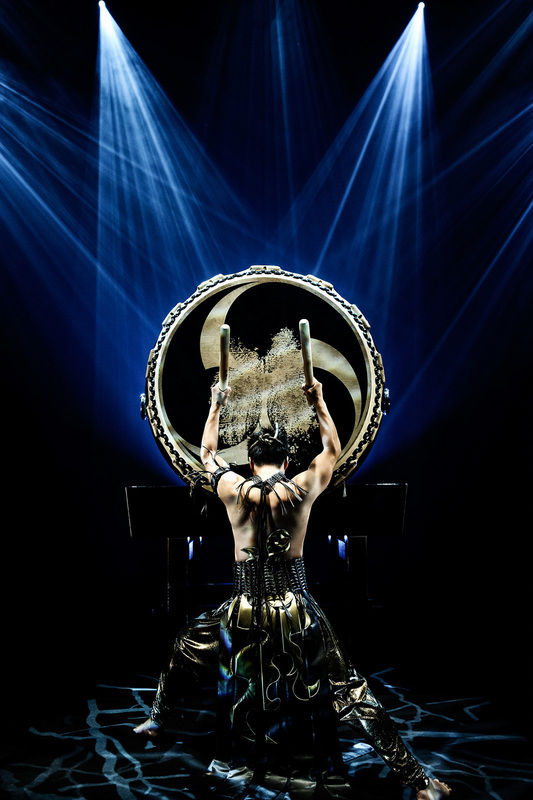 Fans can look forward to a whole new experience in Drum Tao – Rhythm of Tribe which aims to deliver a blockbuster grandeur in this latest production. 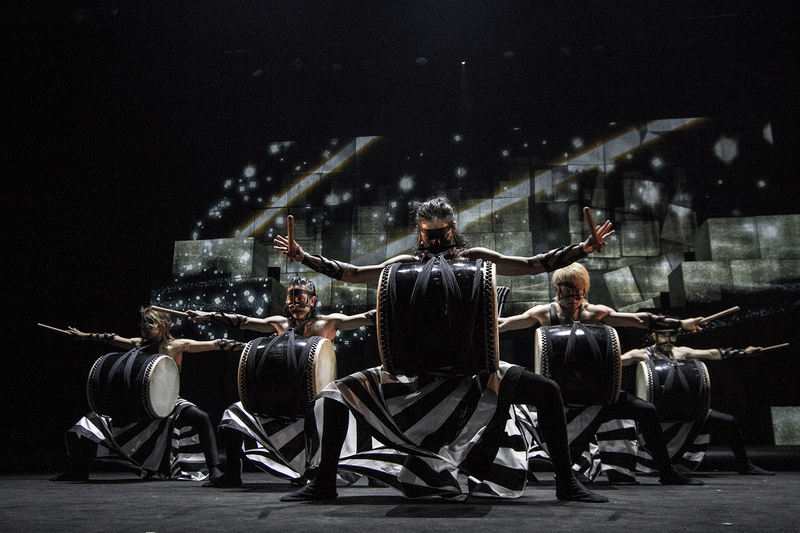 With Japanese drums as the center of attraction and spellbinding projections, Drum Tao will bring you on a time-travel journey to a new dimension with the samurai beyond time and space in search of old Japanese virtues. 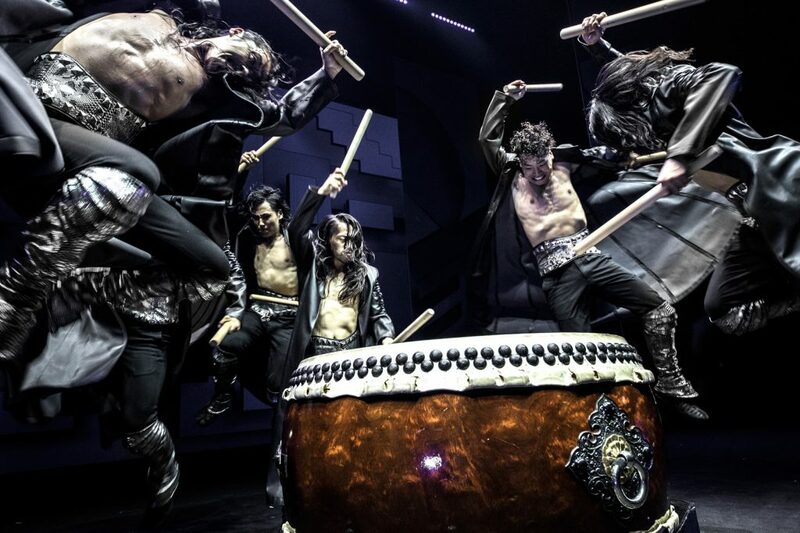 Whether you are a fan of drumming or not, you will definitely enjoy the exhilarating and entertaining performance put up by Japan’s Number 1 Sensation! In 2016, their first appearance on Stephen Colbert Show had a huge impact on American people and their first Off-Broadway shows resulted in great success. 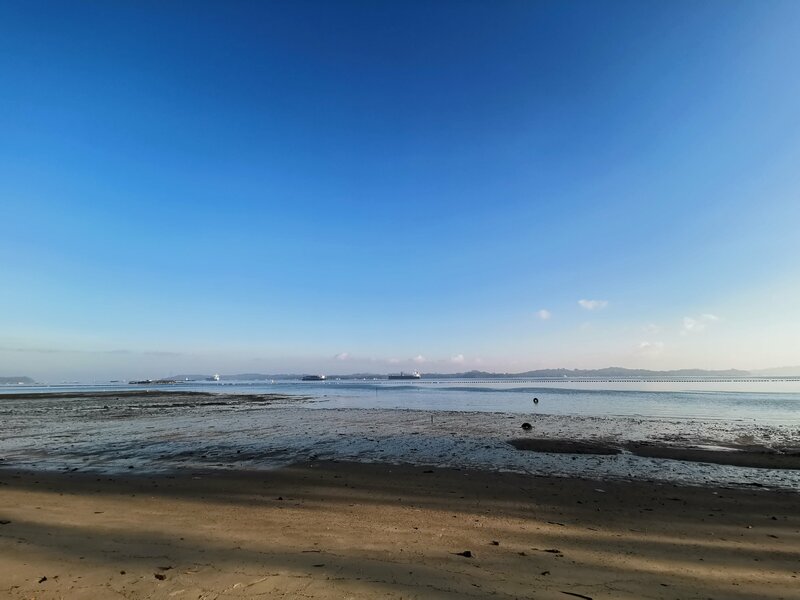 Commissioner Award from the Japanese Tourism Agency, as well as being named “Outstanding Cultural Contribution” from Oita Prefecture and Minister of International Affairs and Communications Award. 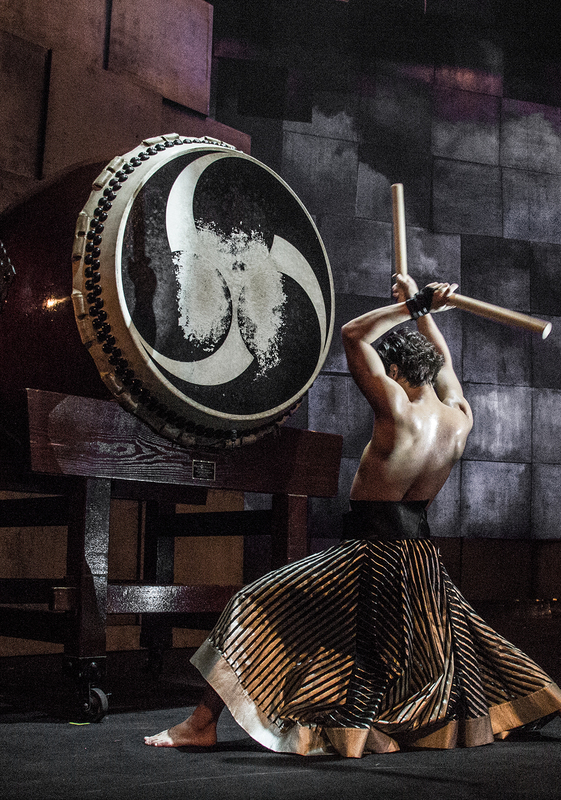 TAO rewrites the history of traditional Japanese drumming, and yet proudly remains the greatest Drum Performers in Japan.